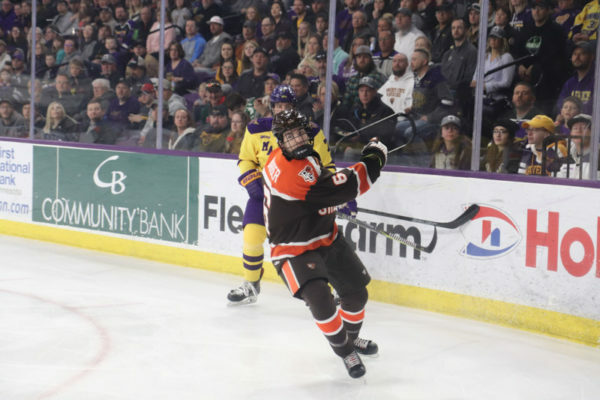 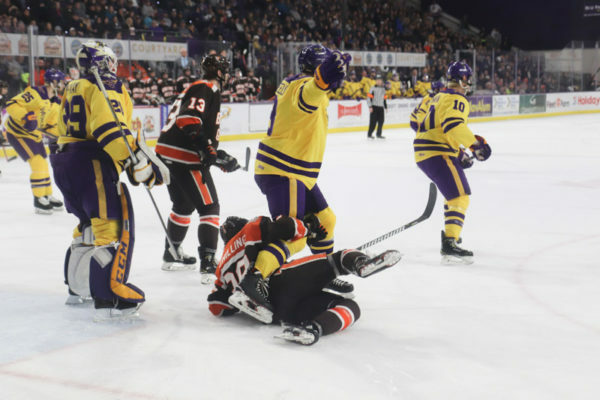 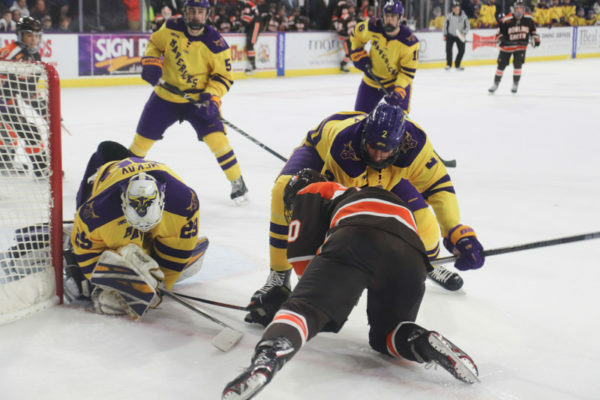 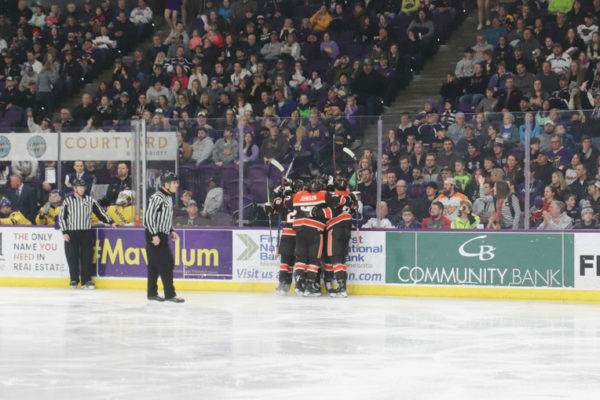 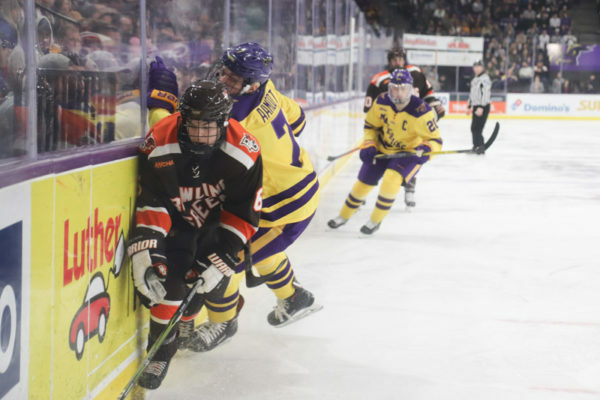 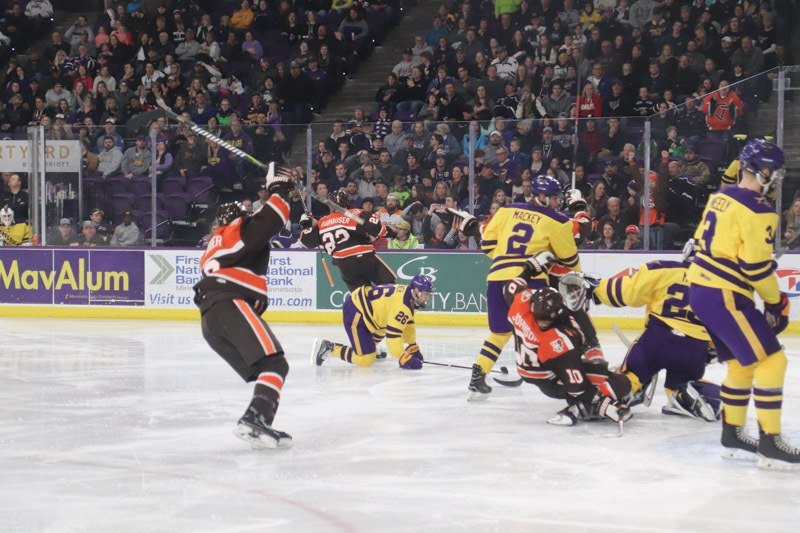 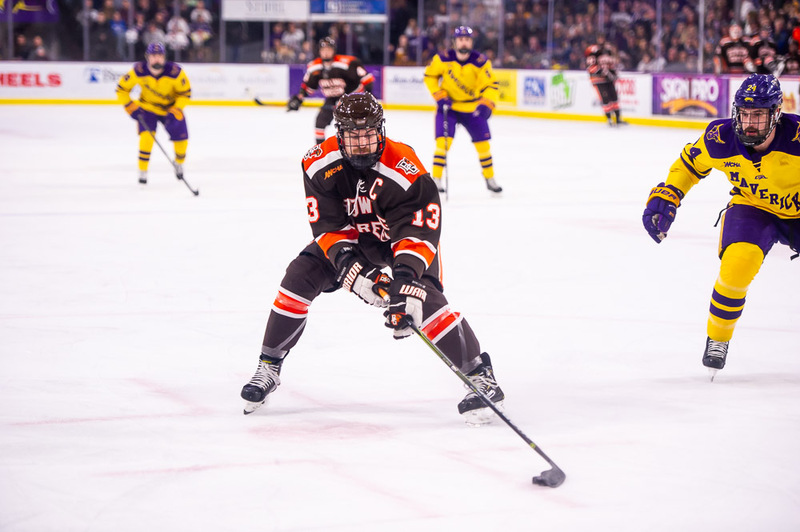 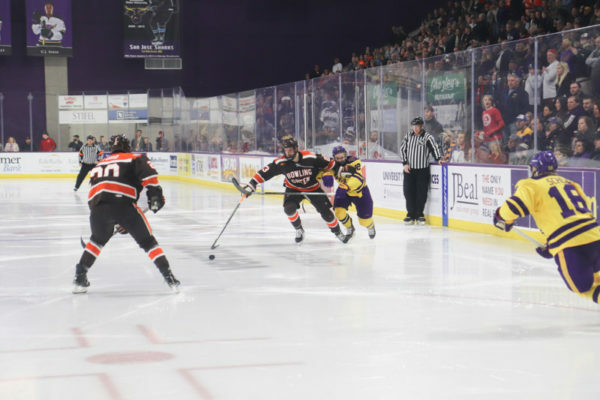 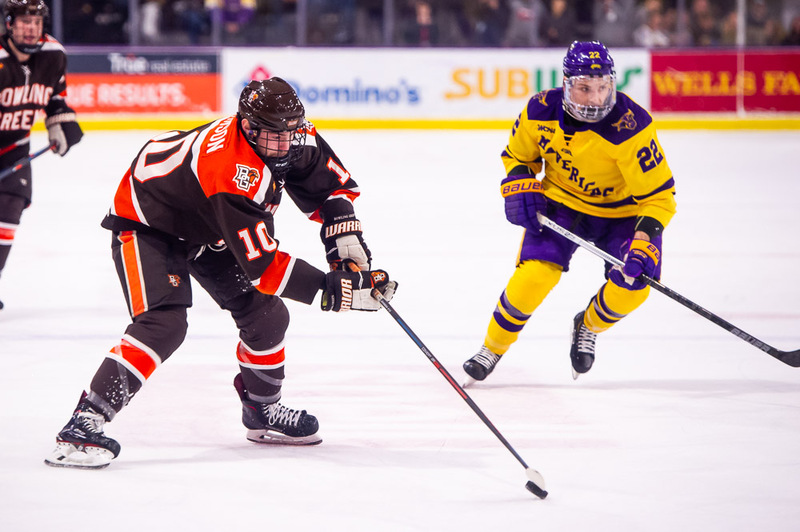 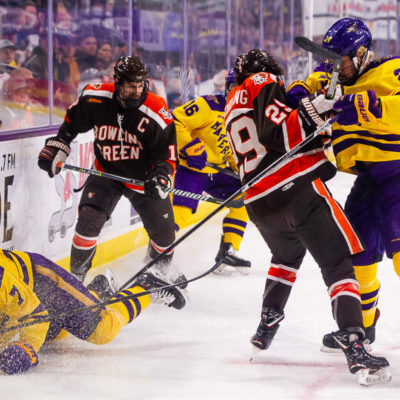 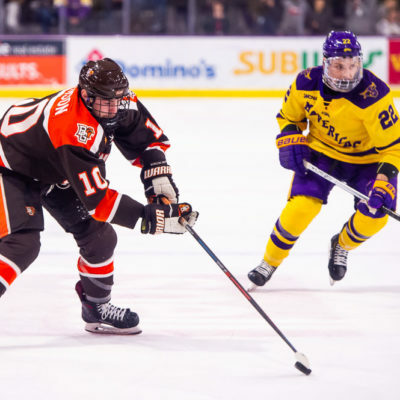 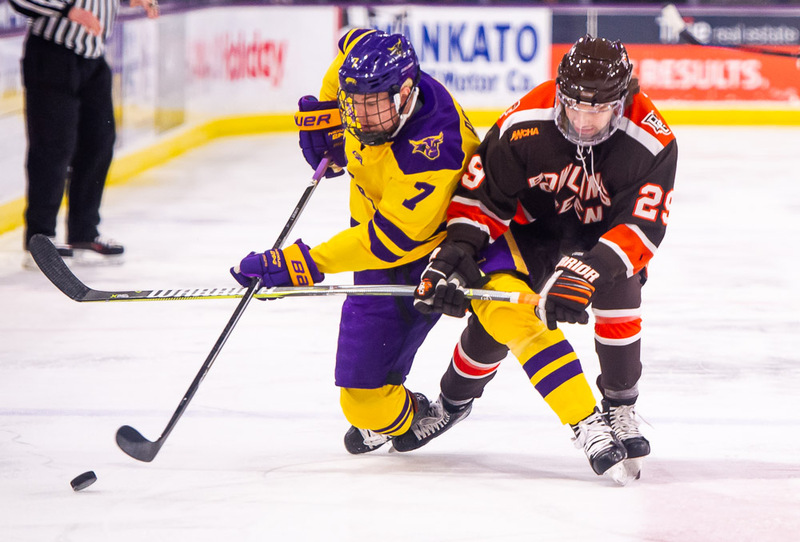 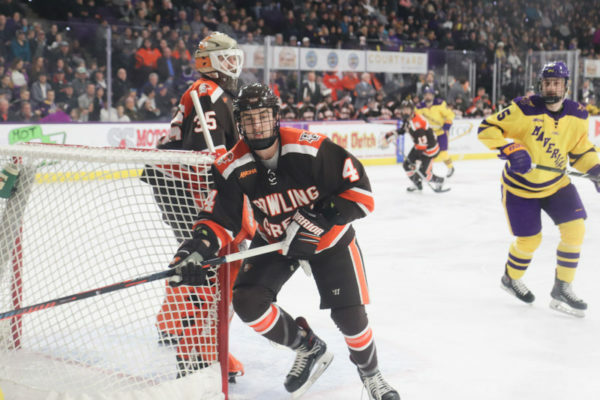 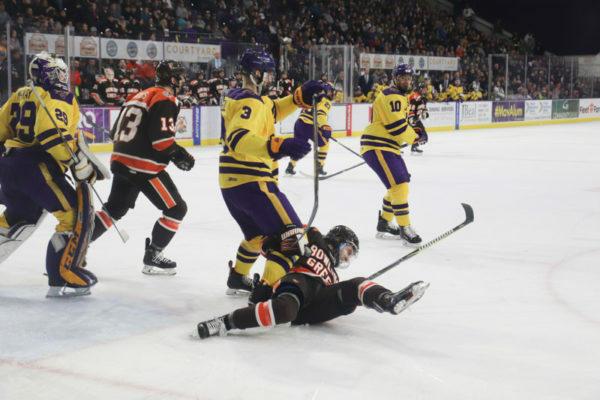 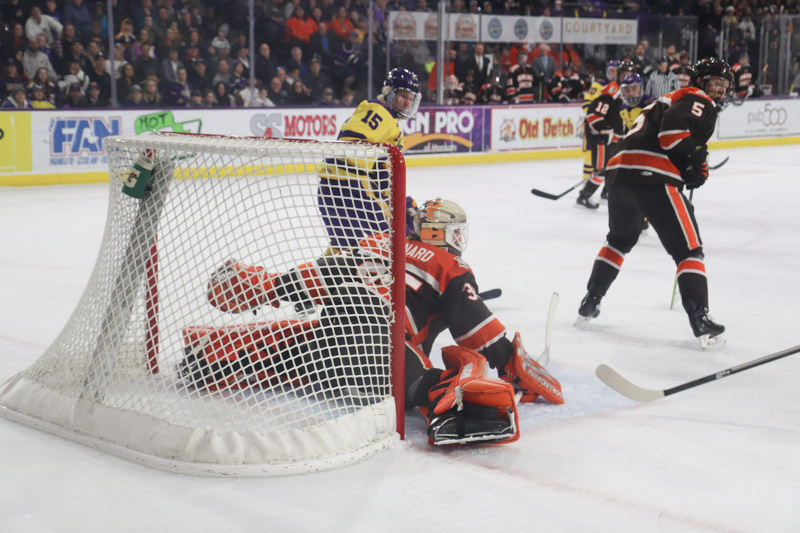 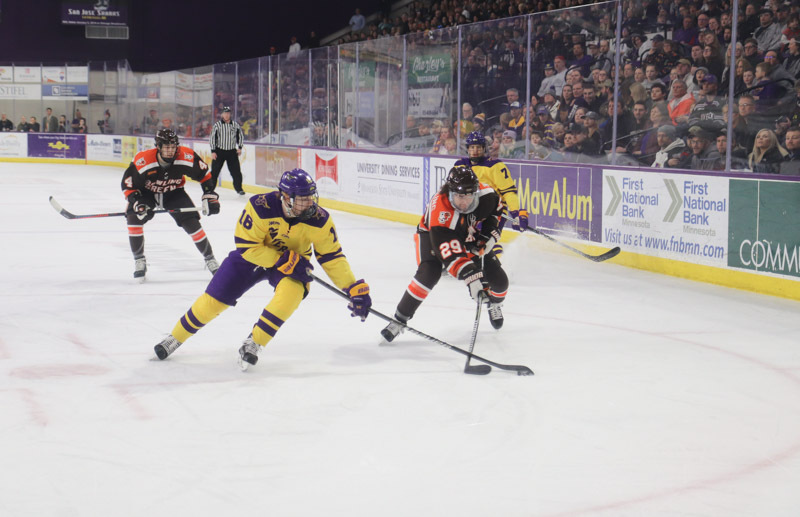 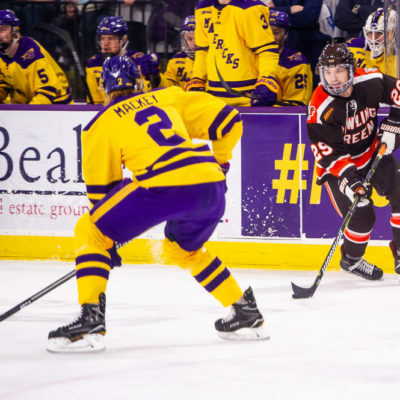 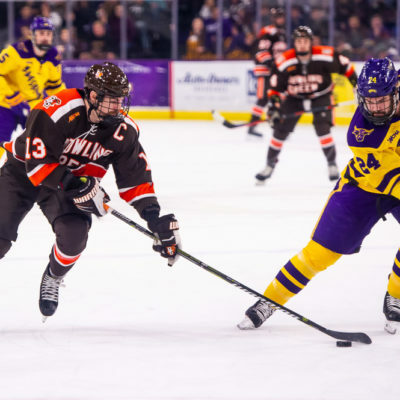 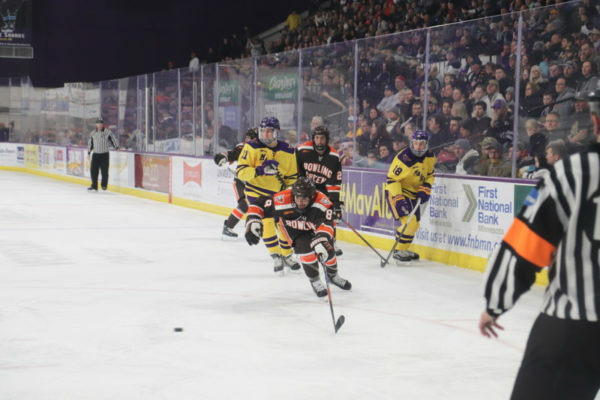 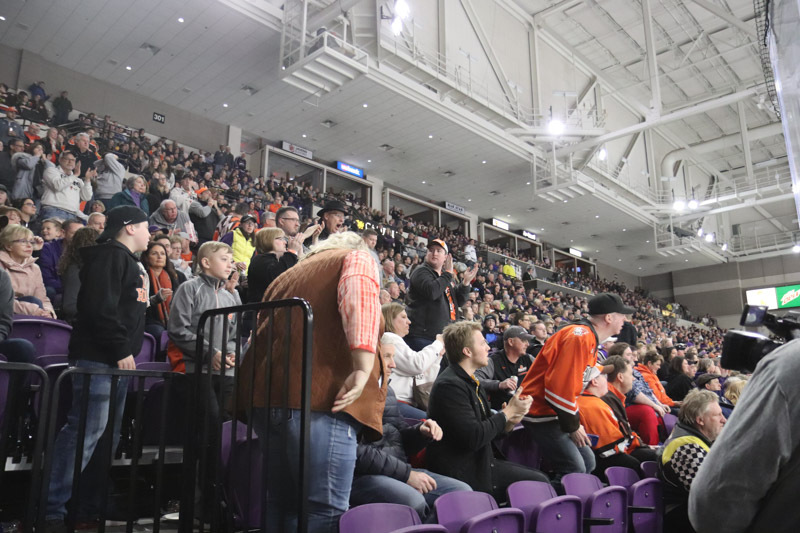 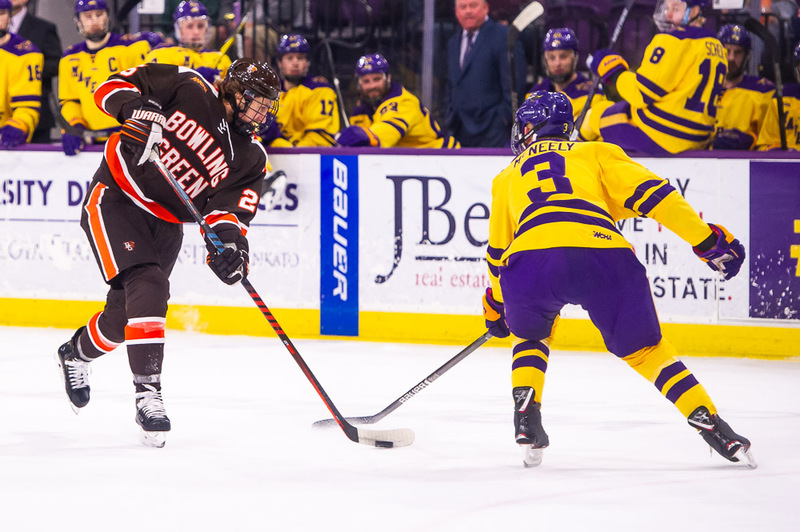 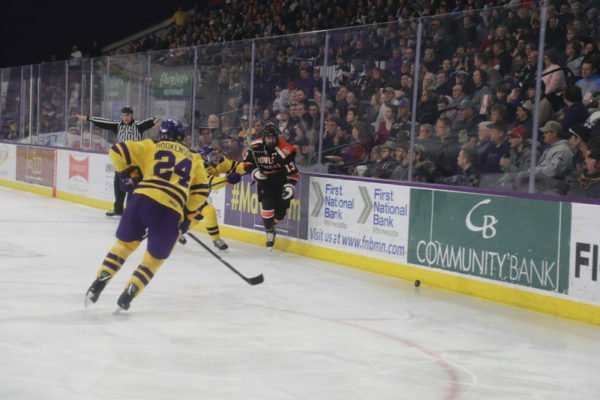 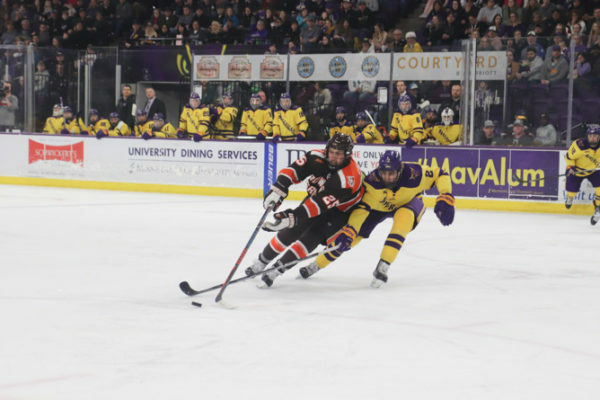 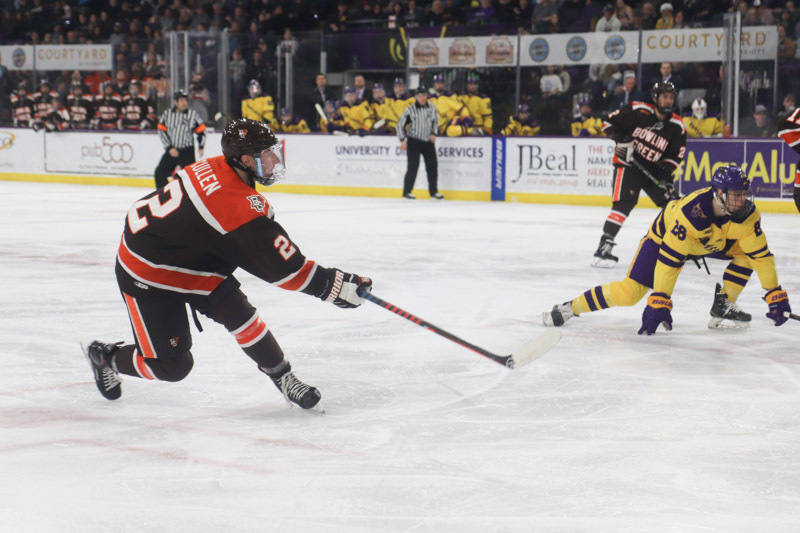 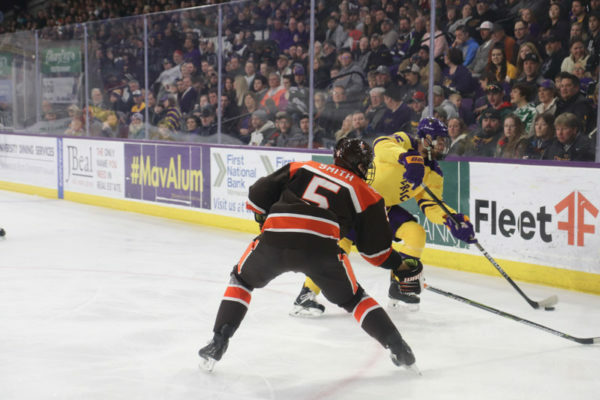 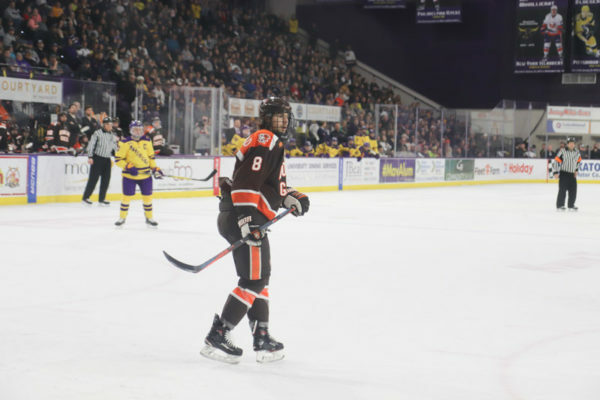 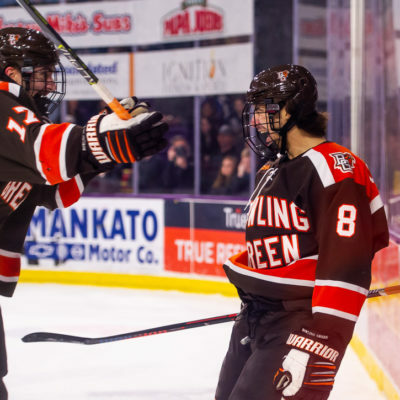 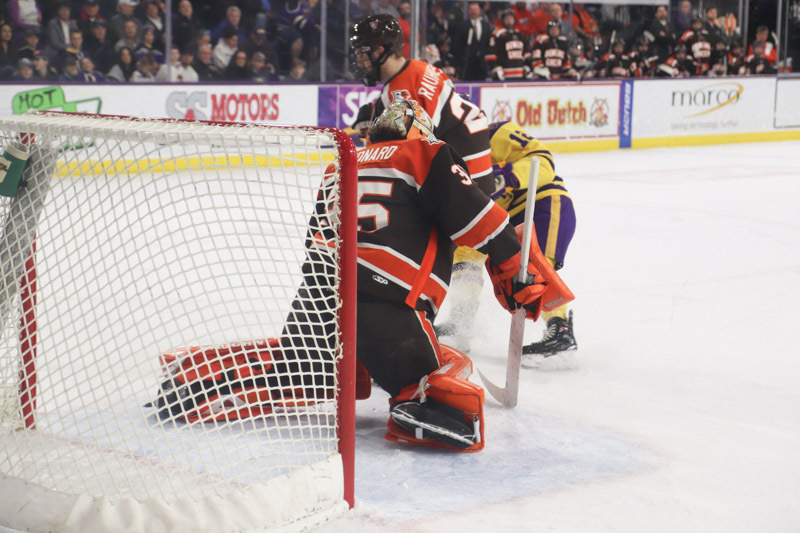 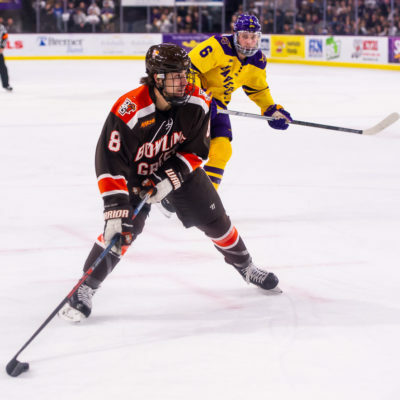 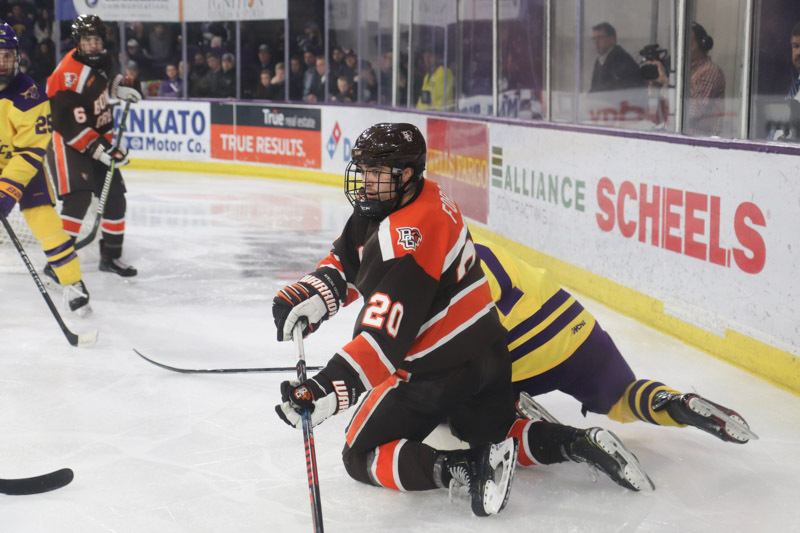 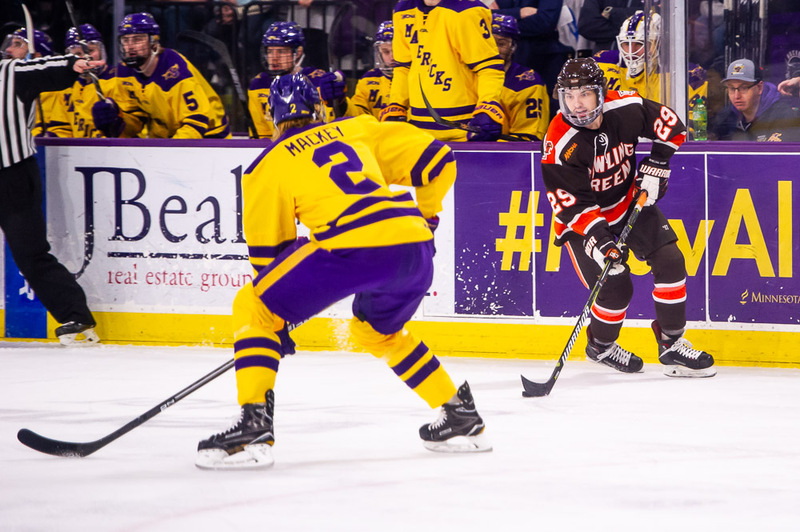 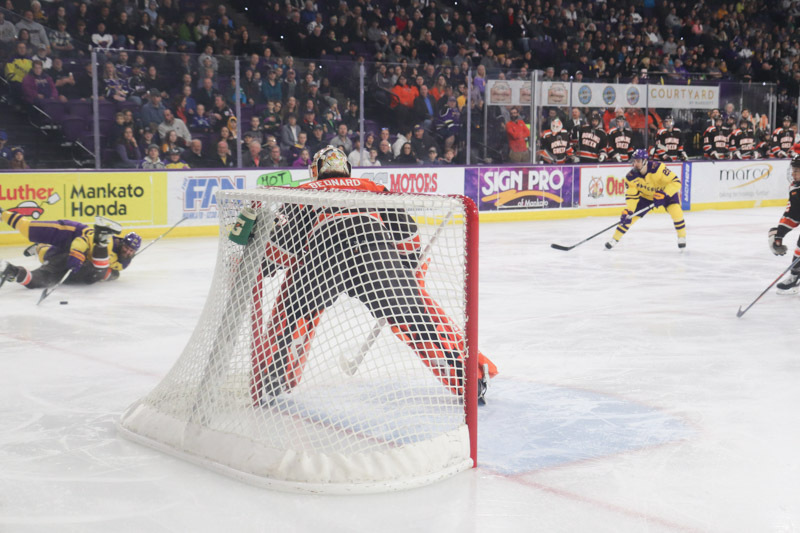 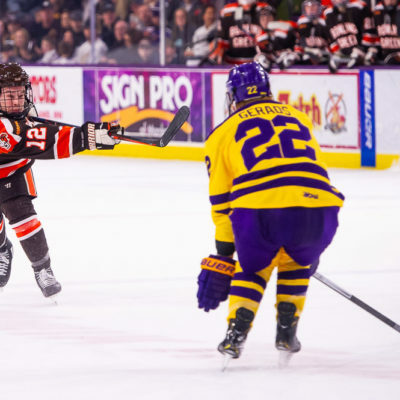 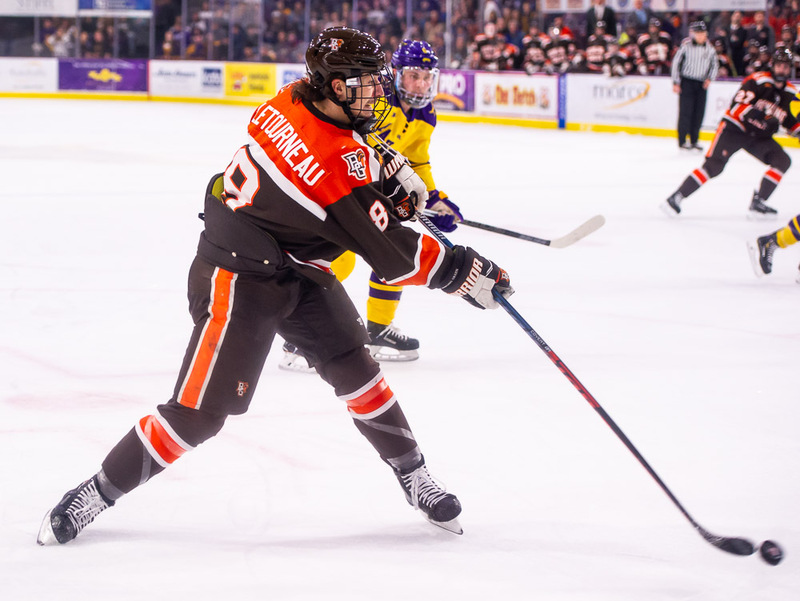 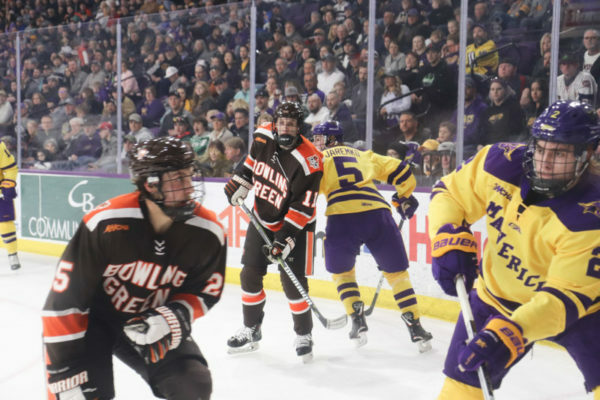 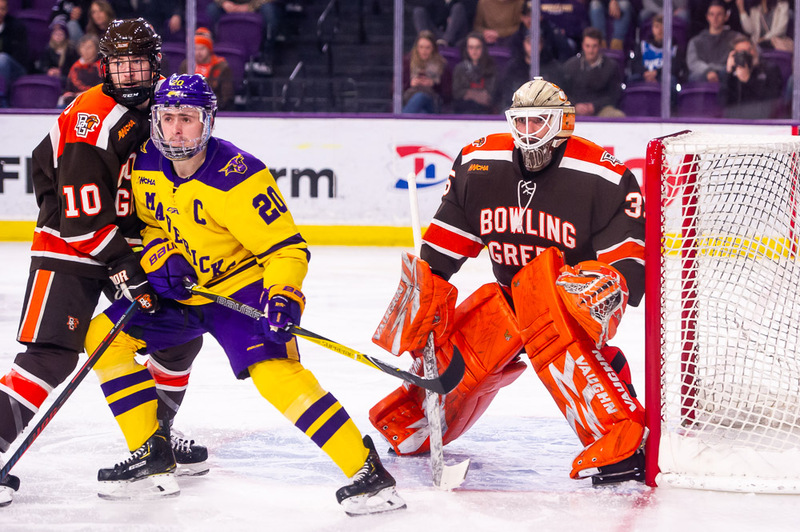 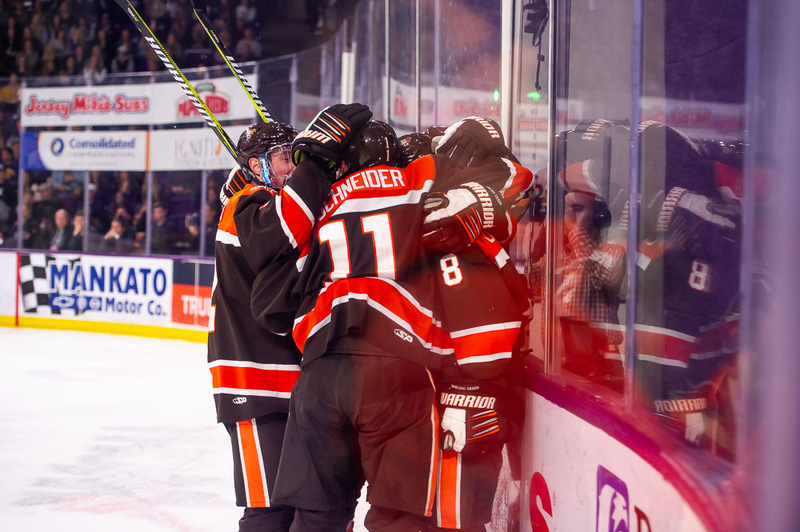 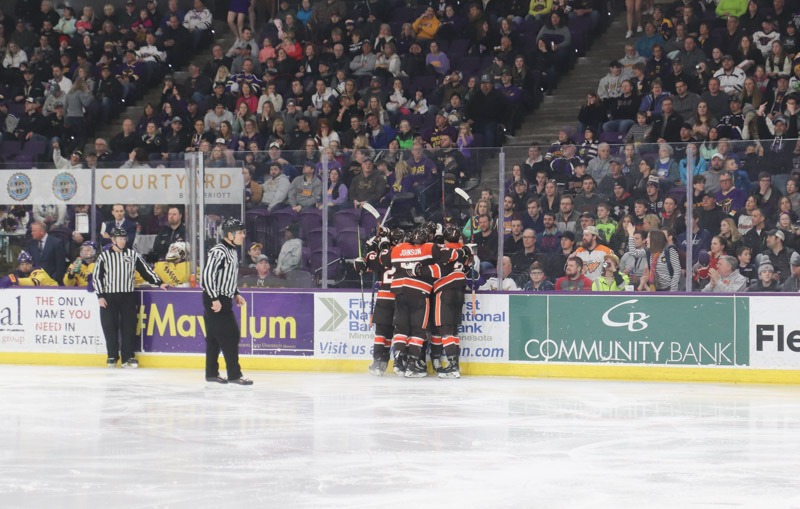 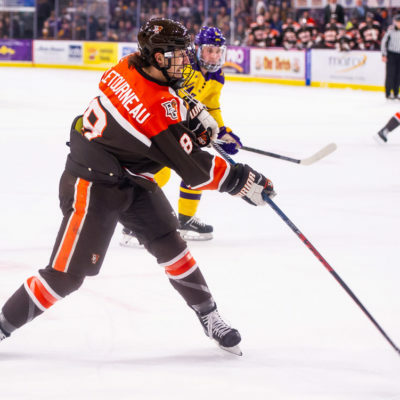 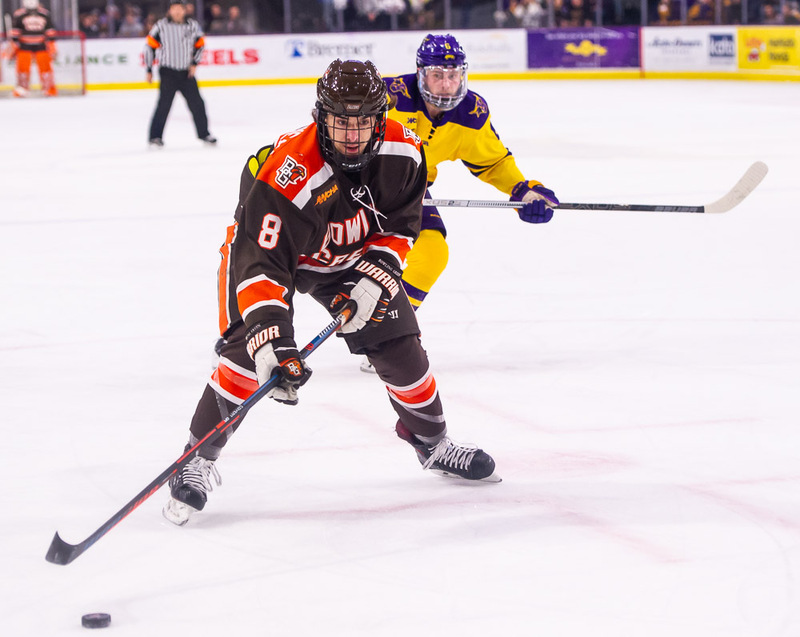 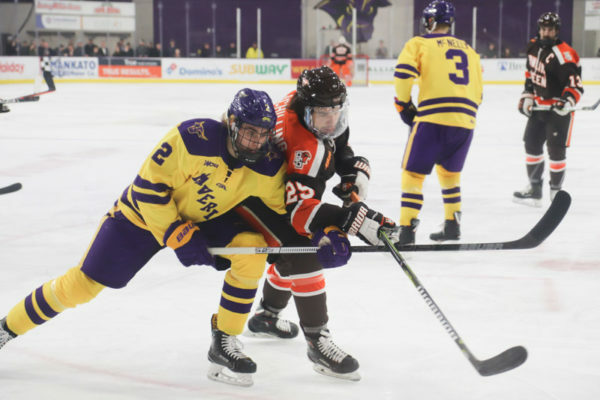 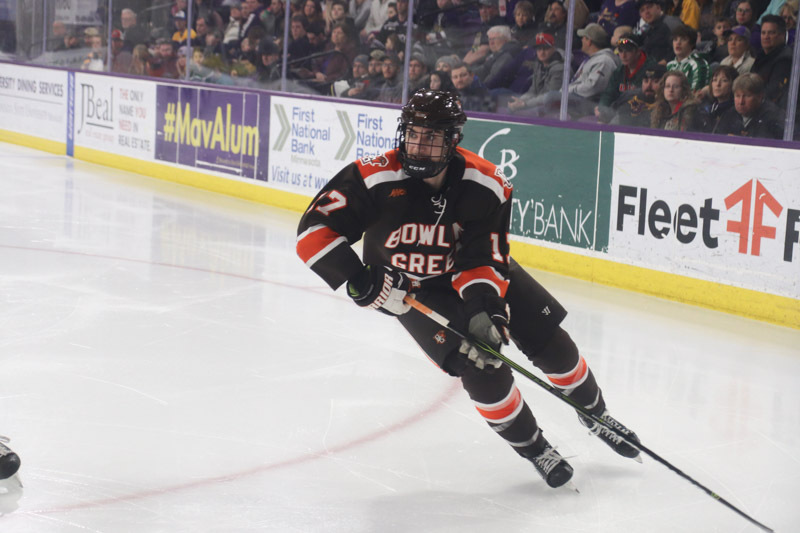 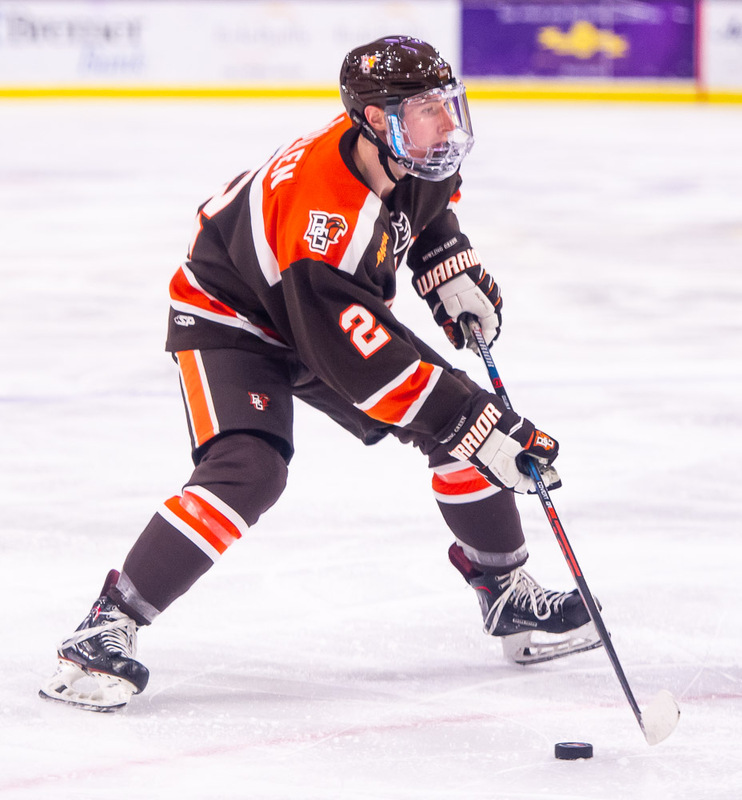 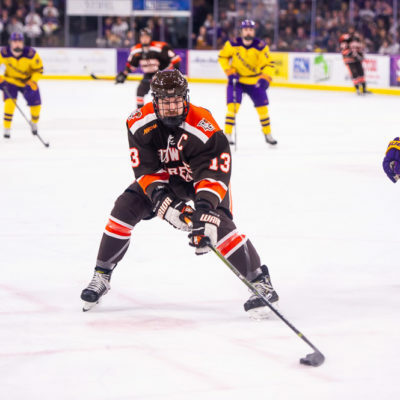 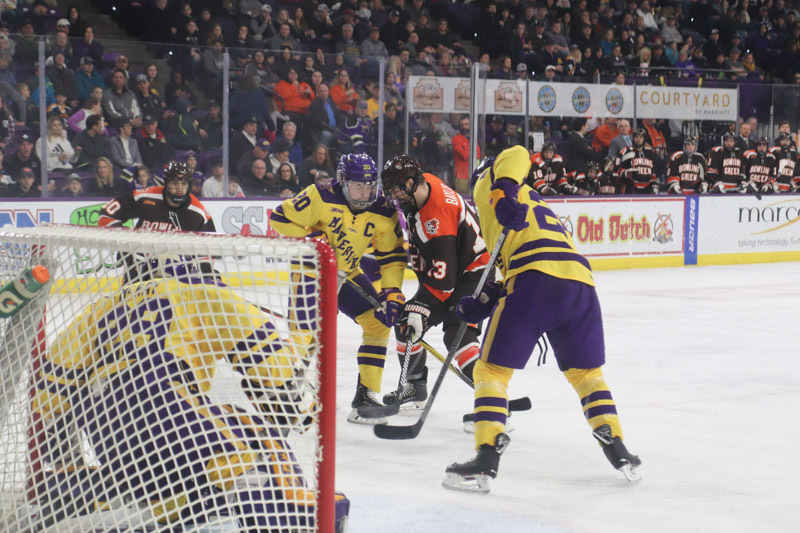 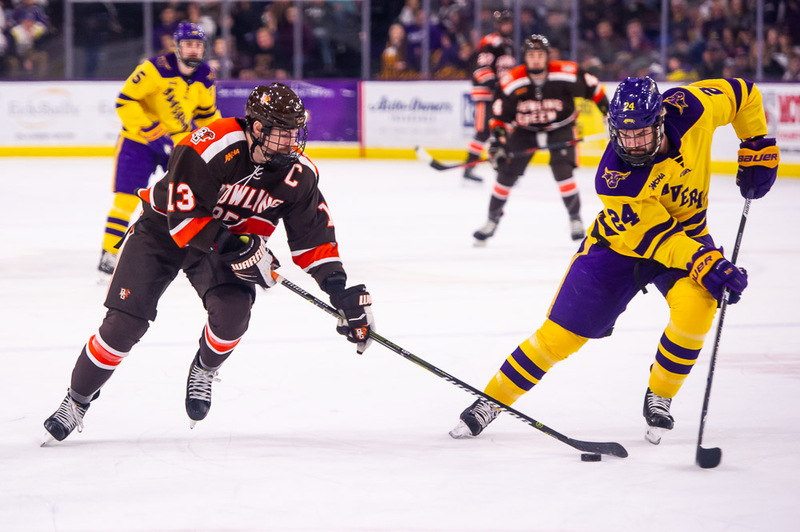 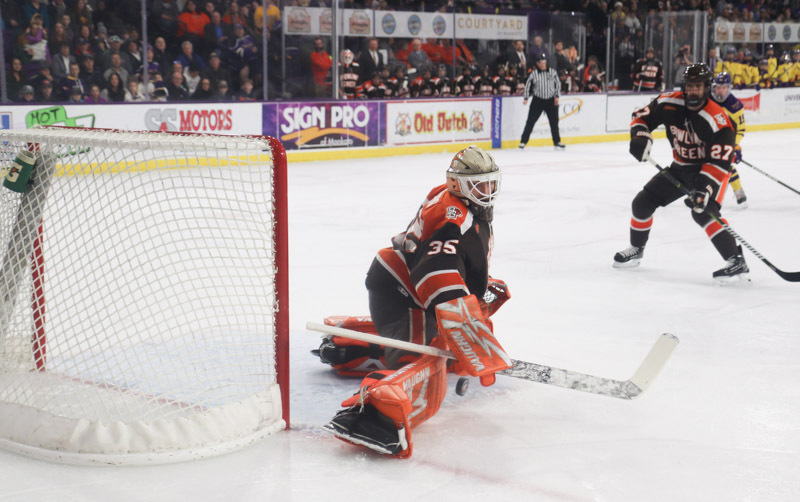 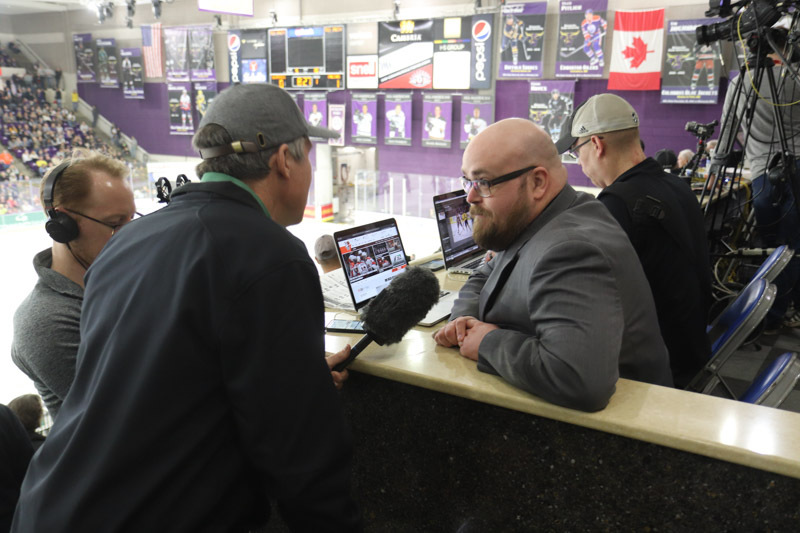 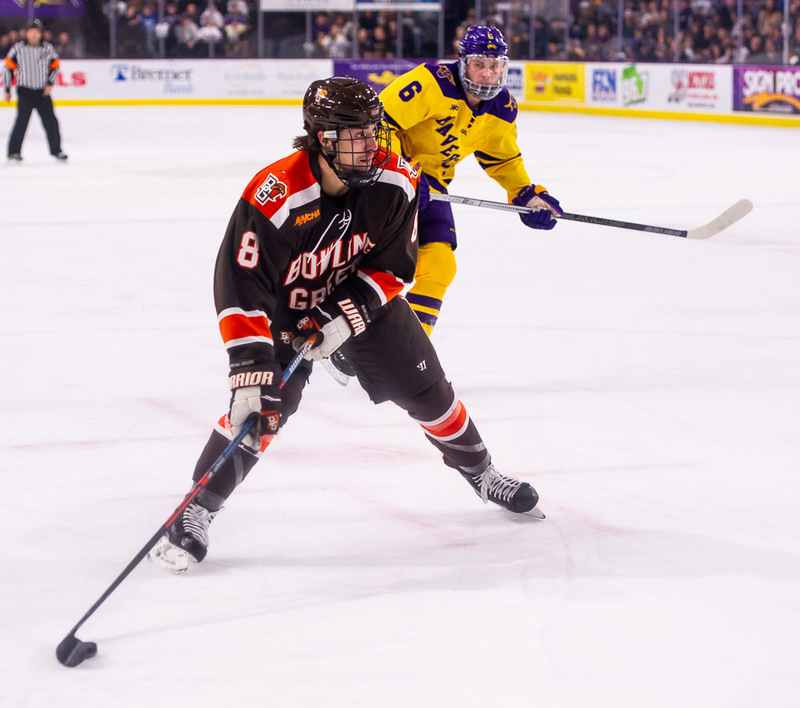 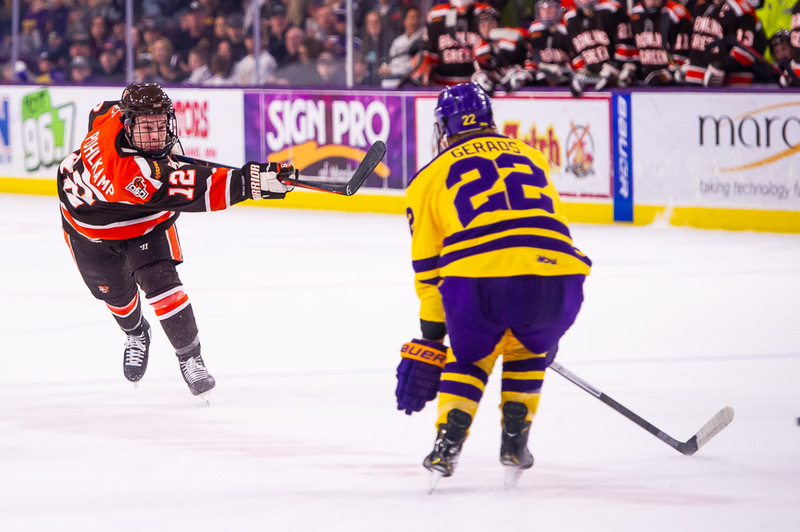 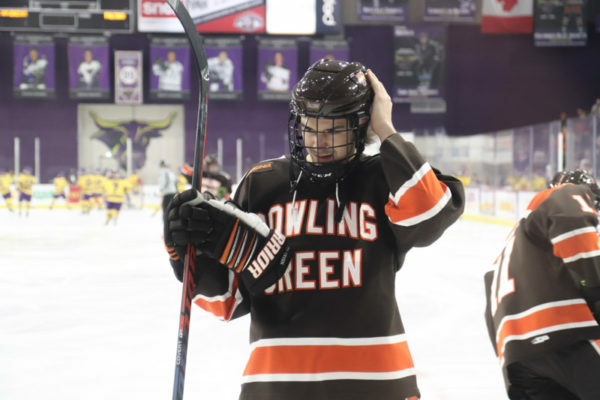 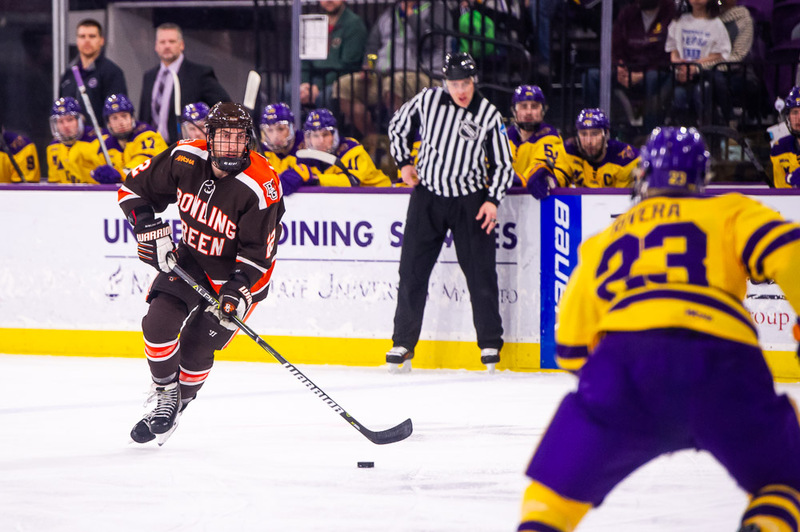 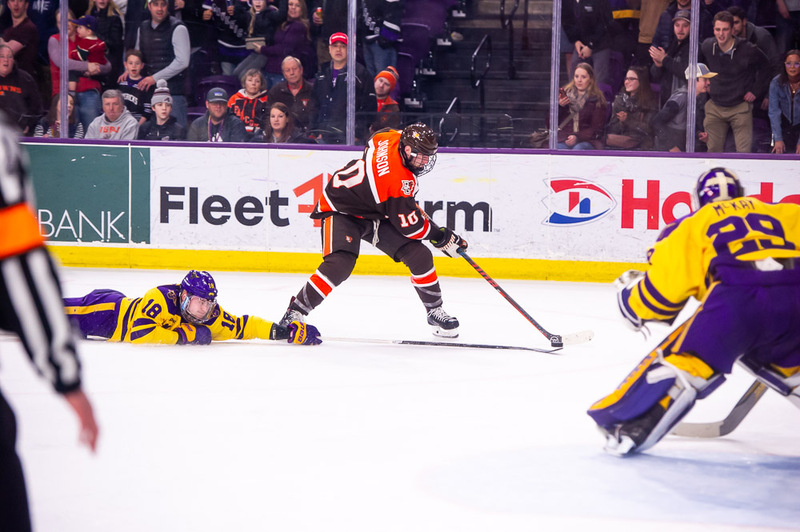 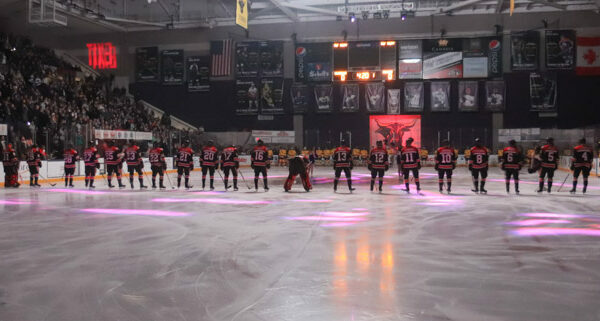 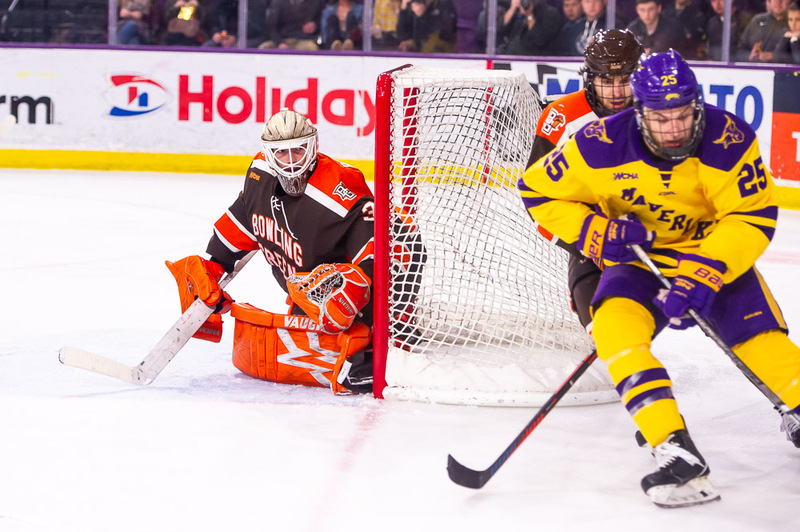 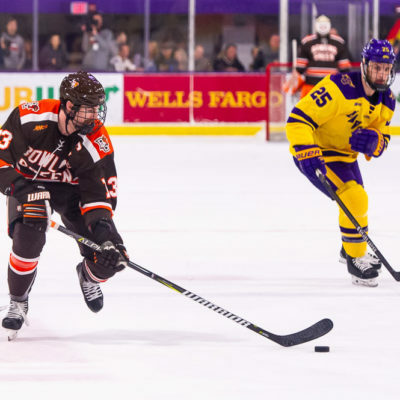 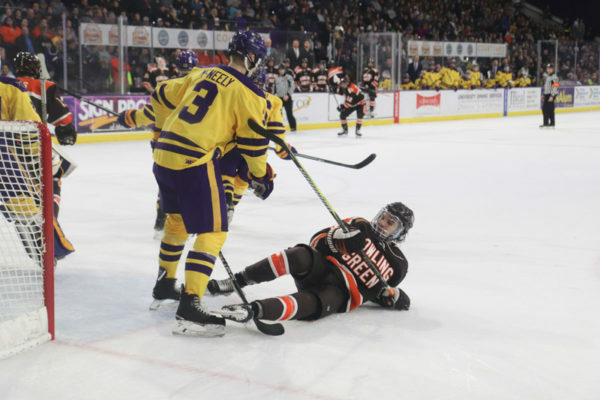 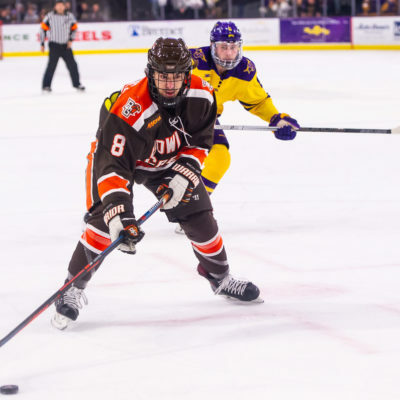 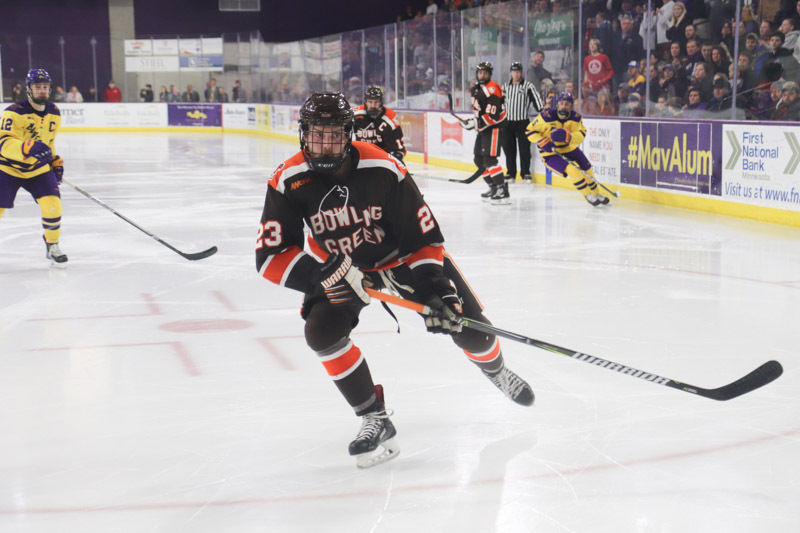 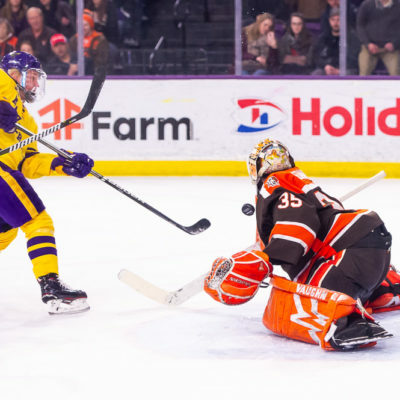 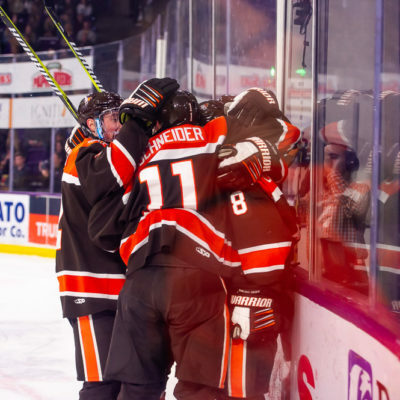 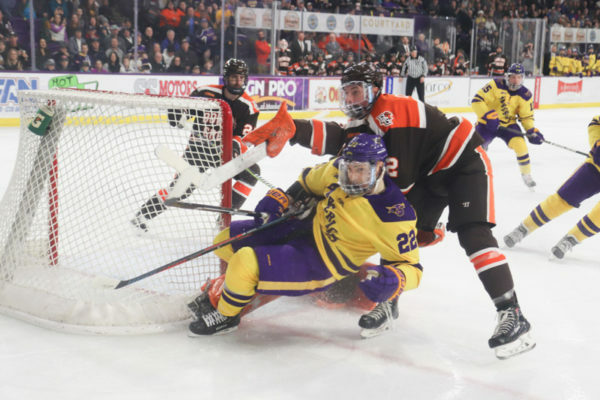 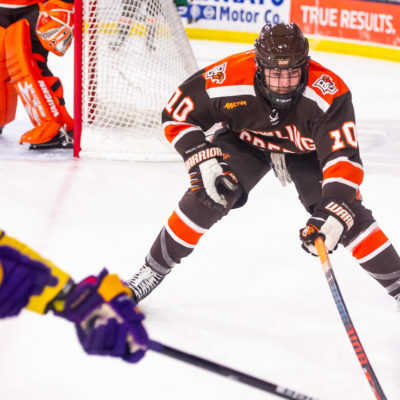 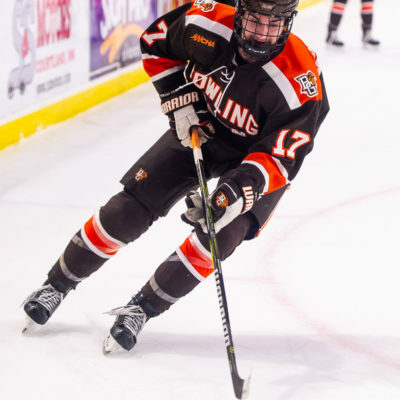 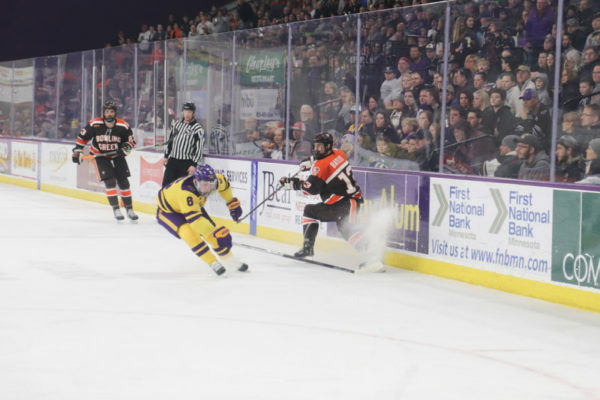 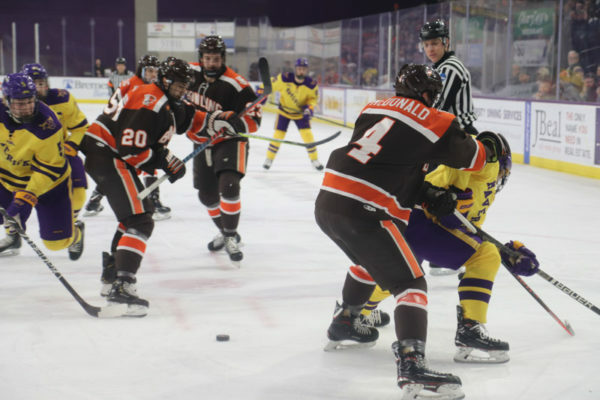 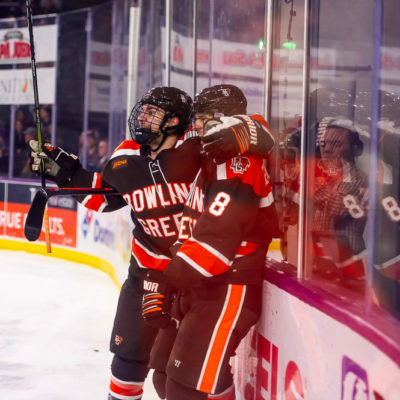 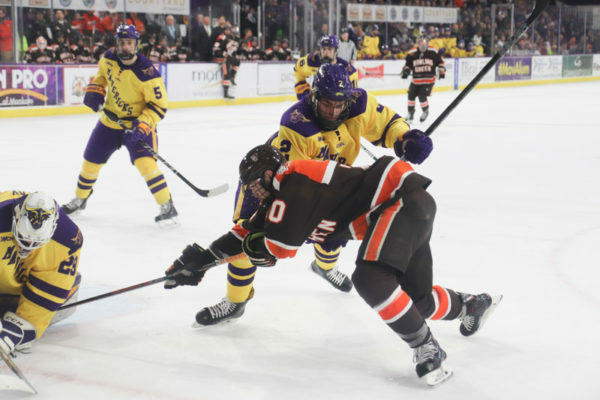 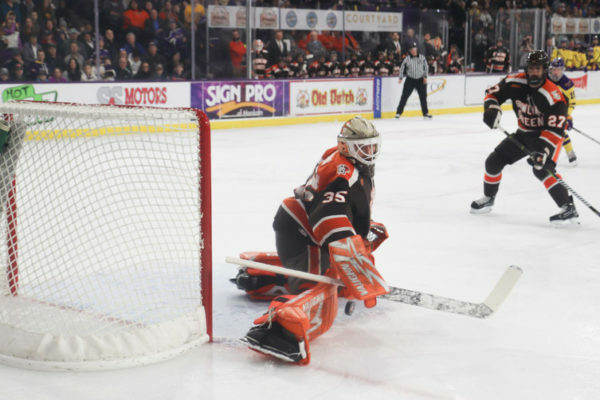 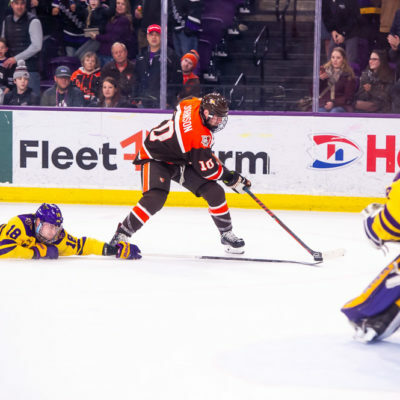 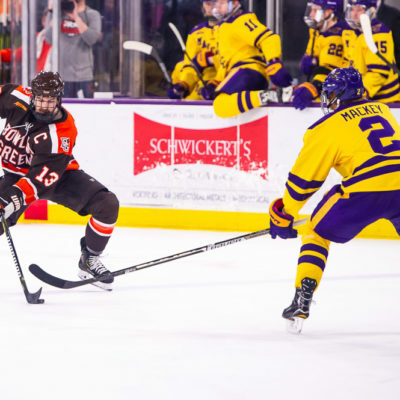 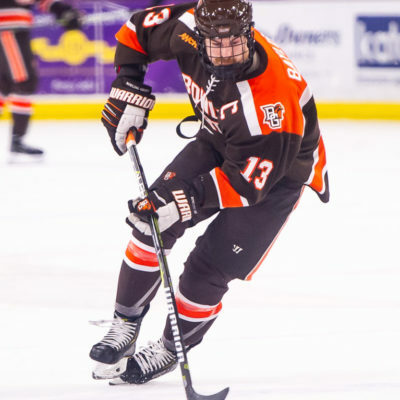 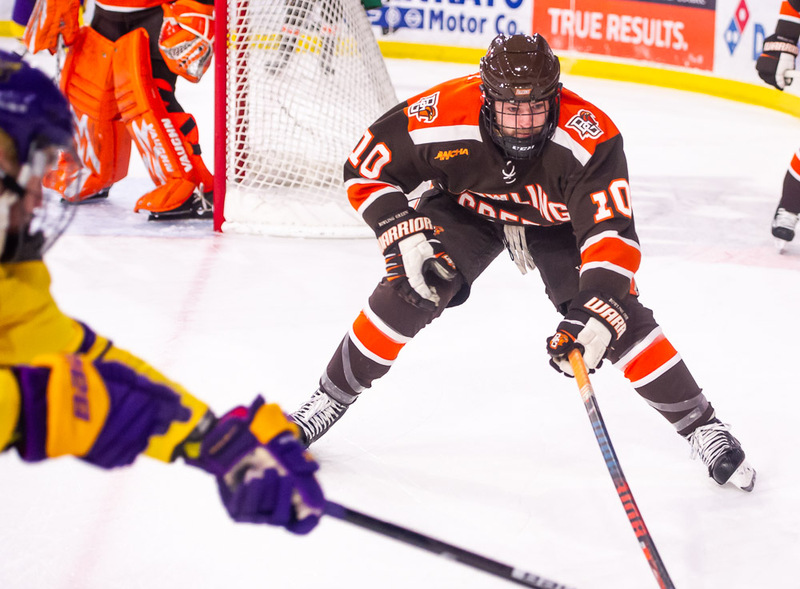 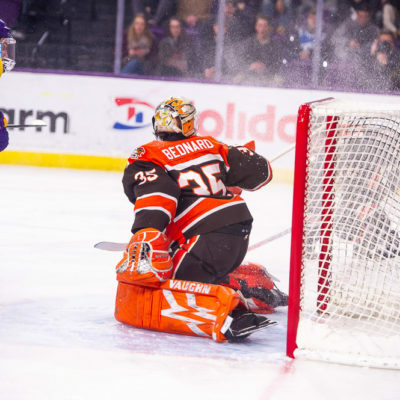 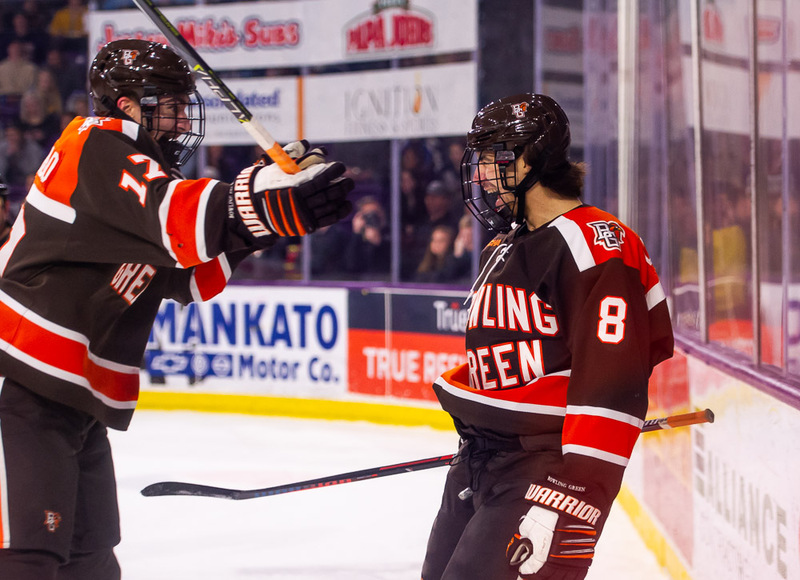 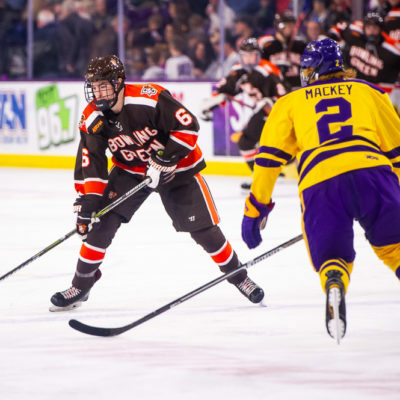 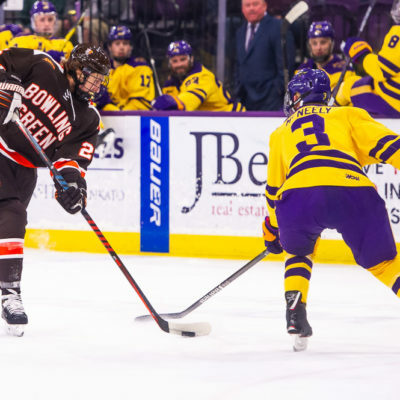 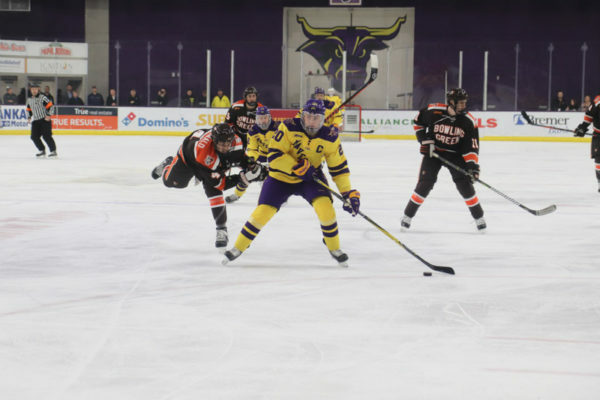 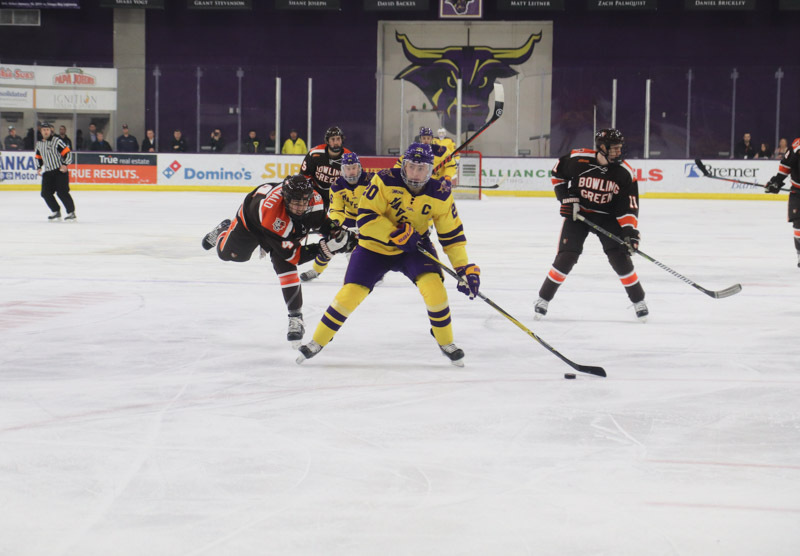 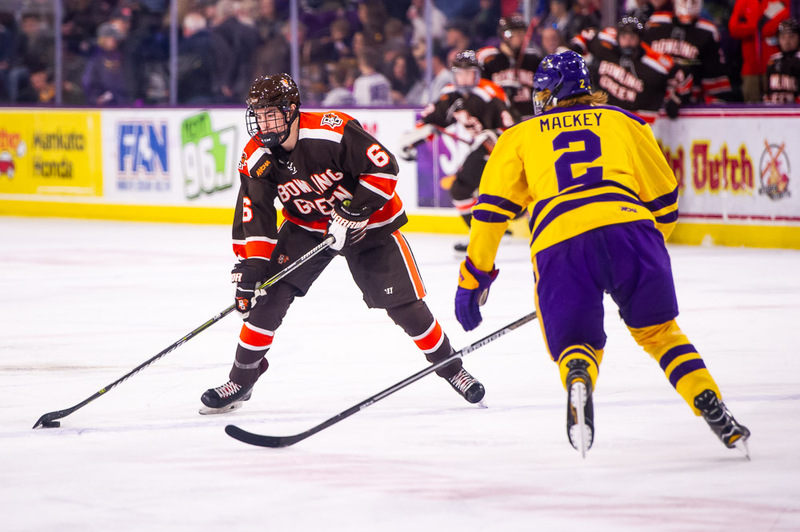 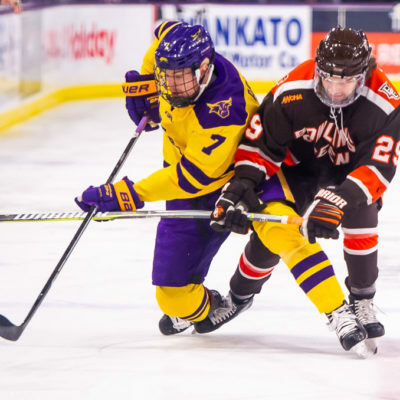 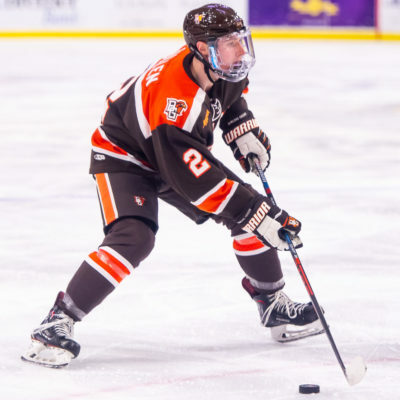 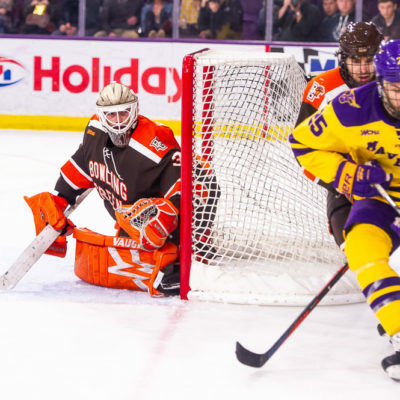 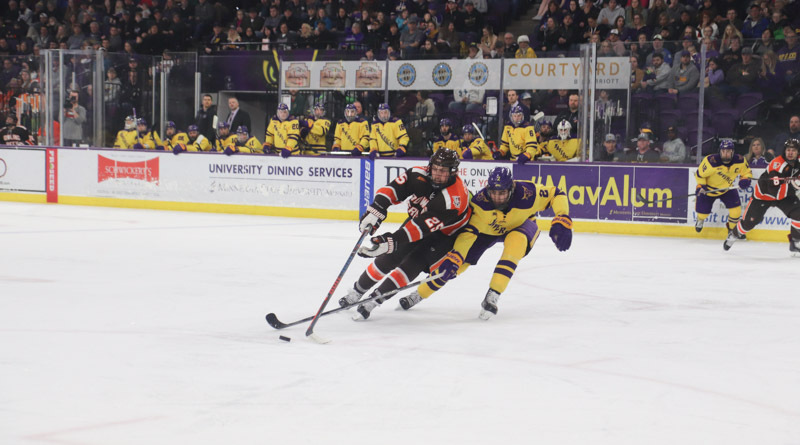 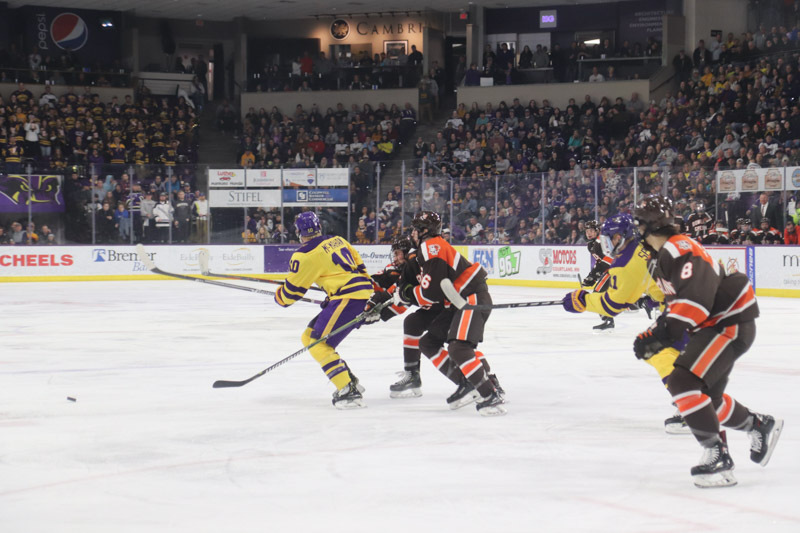 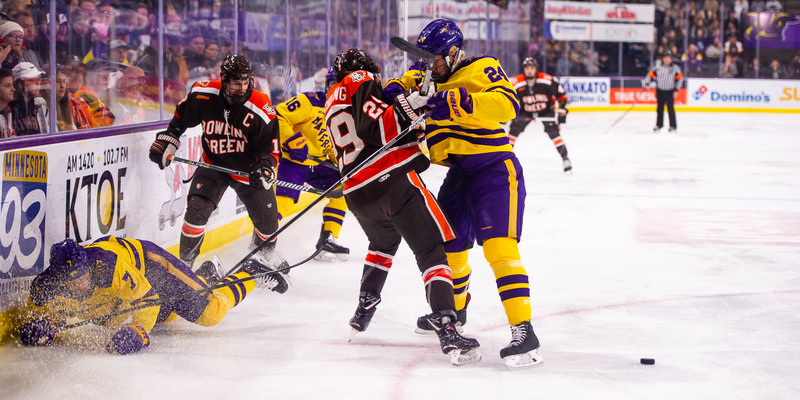 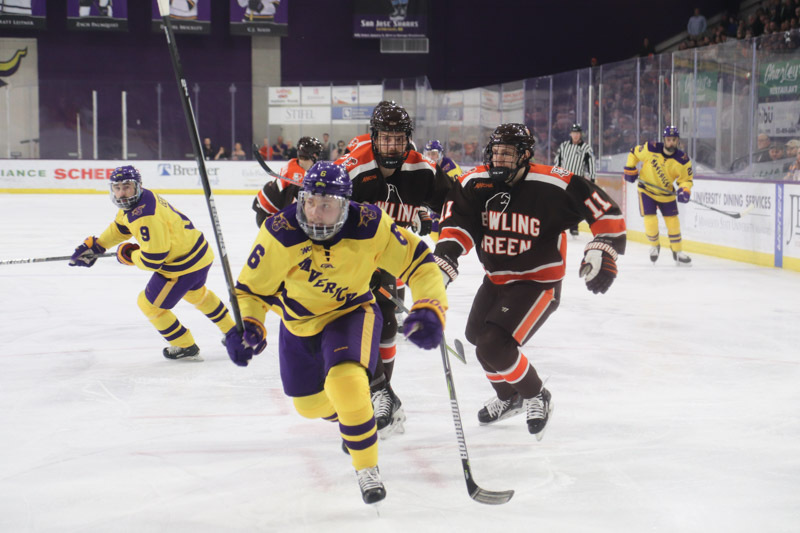 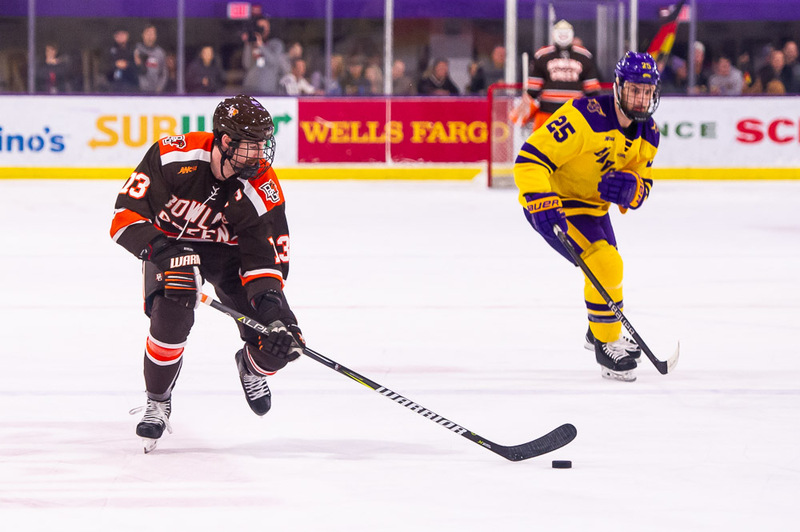 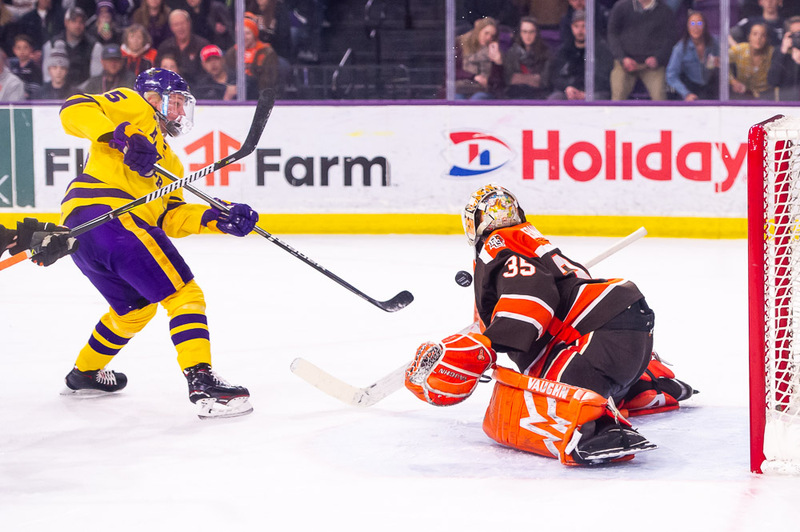 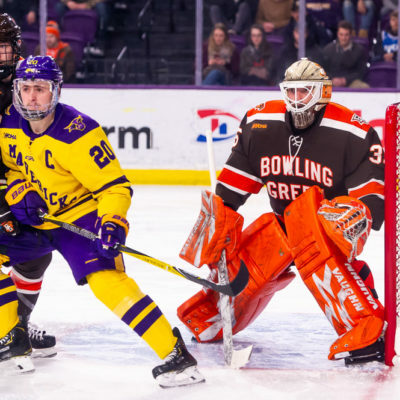 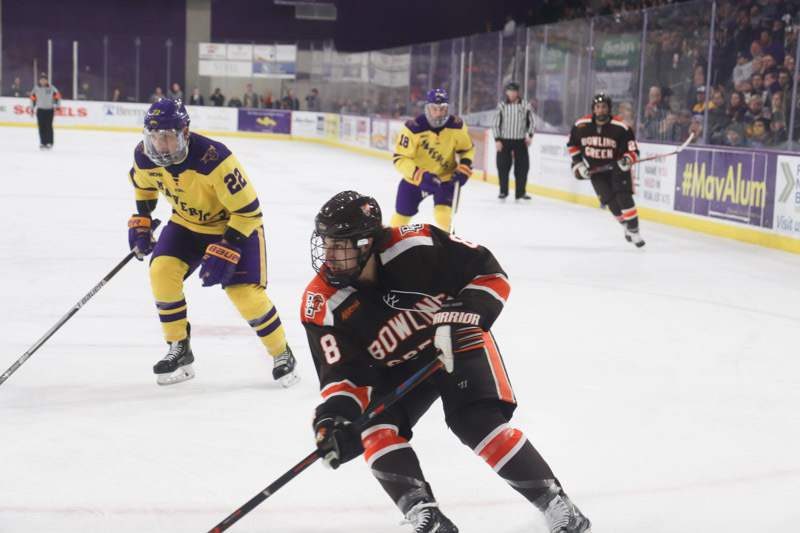 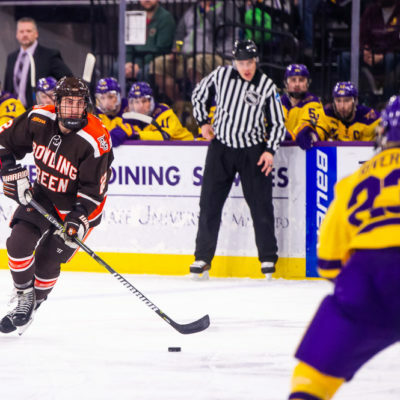 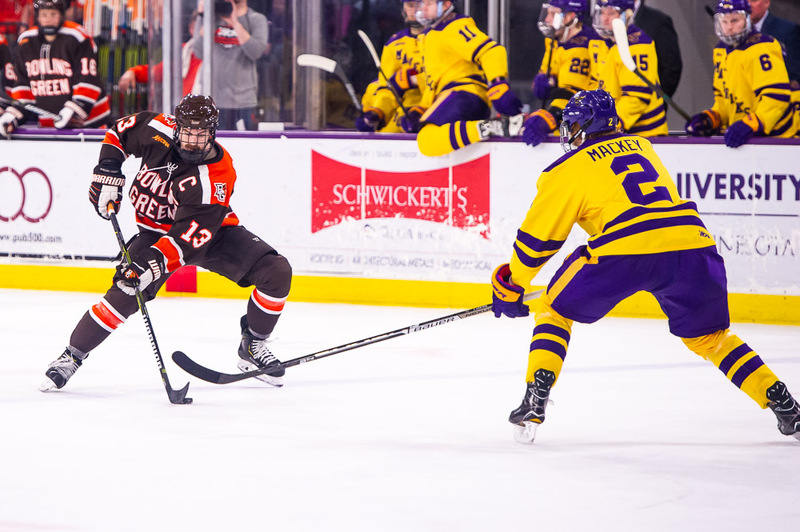 Mankato, MN – The 13th-ranked Falcons carried a 2-0 lead into the final two minutes of the WCHA Championship game Saturday . 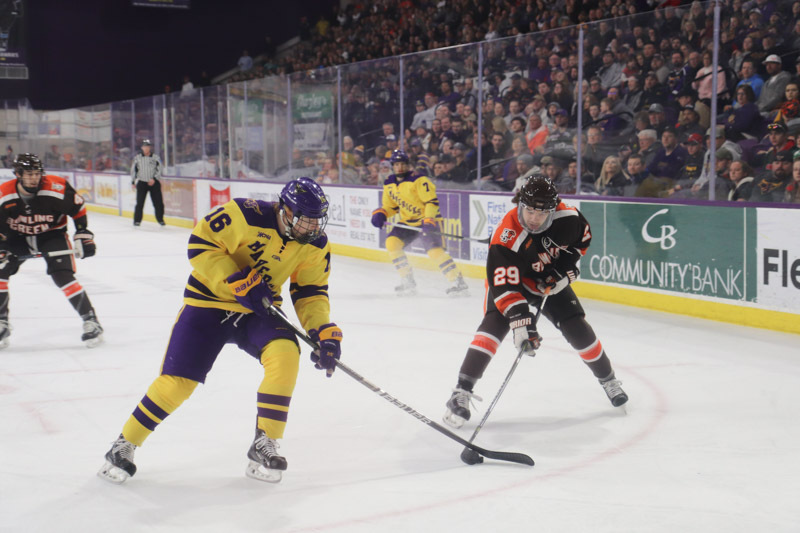 But, a pair of Maverick goals in 44 seconds late in the third period gave Minnesota State life. 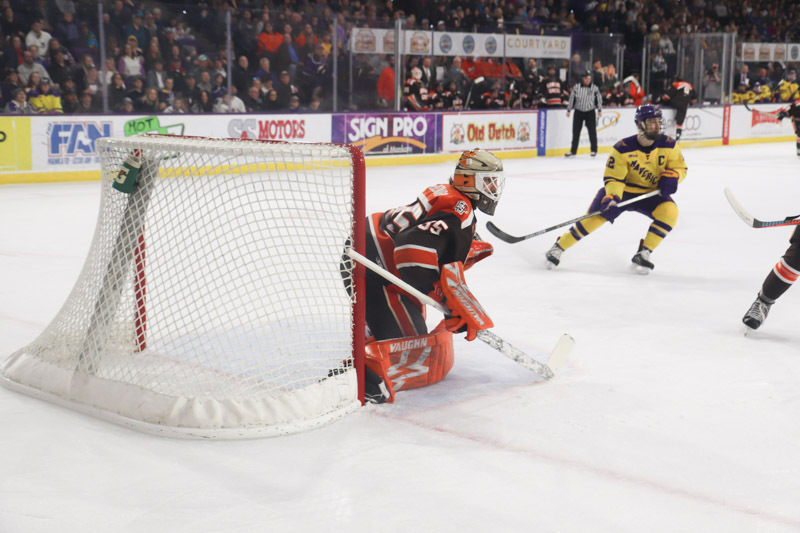 An overtime winner by Nick Rivera completed the comeback for Minnesota State. 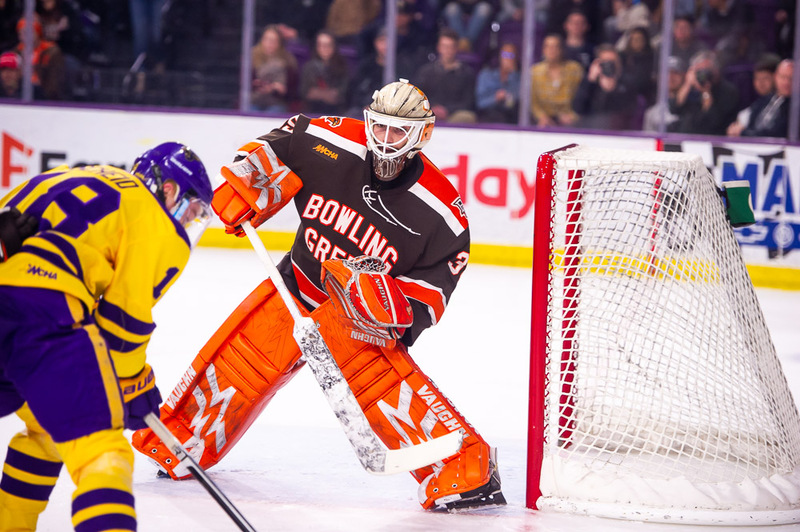 Ryan Bednard started in net for the Falcons, stopping 24 of 27 shots faced. 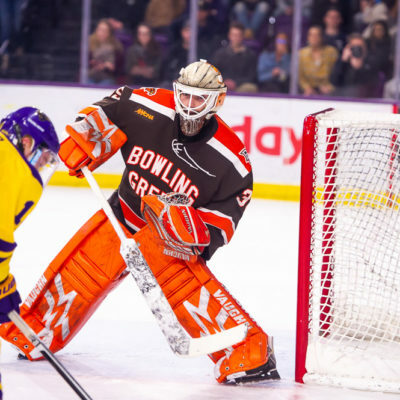 Dryden McKay turned aside 17 of the 19 attempts he faced. 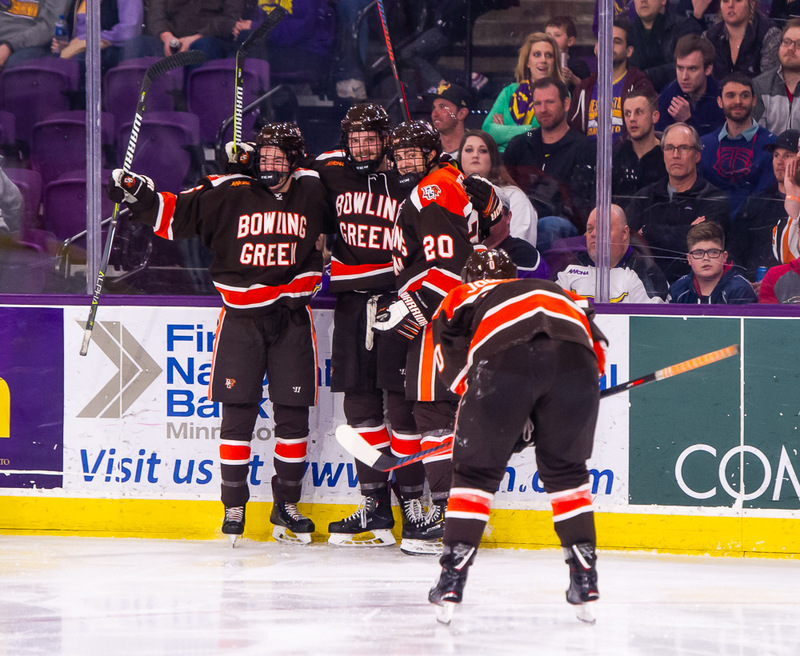 The Falcons picked up the game’s first goal at 14:56 of the first period. 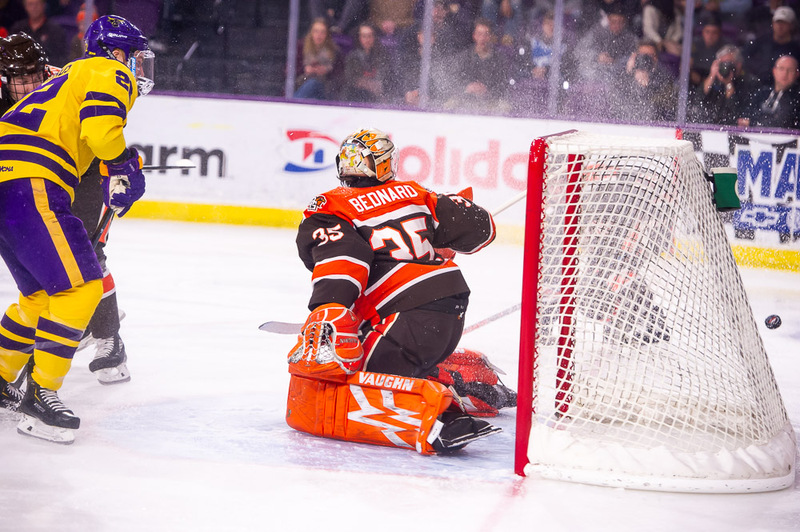 Taylor Schneider left the puck for Frederic Letourneau who lasered a wrist shot from a steep angle, beating McKay over his shoulder. The goal was also assisted by Will Cullen and was Letourneau’s seventh goal of the season. 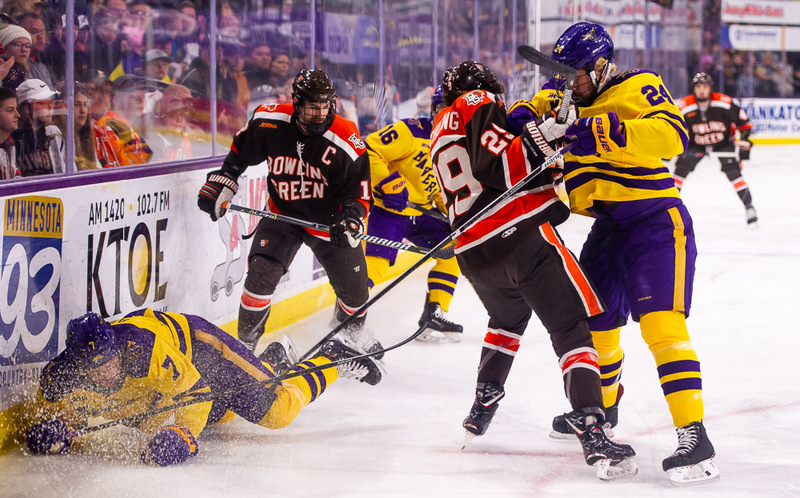 Bowling Green finished the first period with ten shots on net, while Minnesota State had five chances. 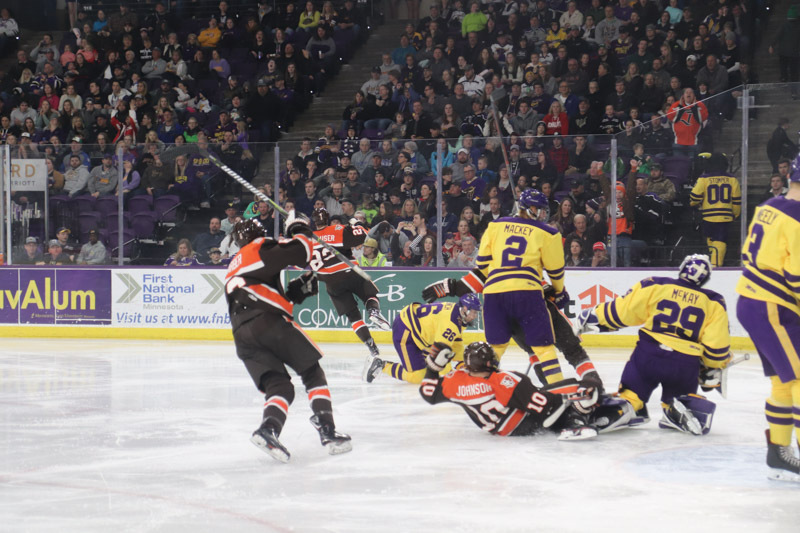 Things tightened up for both teams in the middle frame as neither team found the net. Both teams had six shots in the second period. The Falcons added a power-play goal at 1:28 of the third period to push their lead to 2-0. 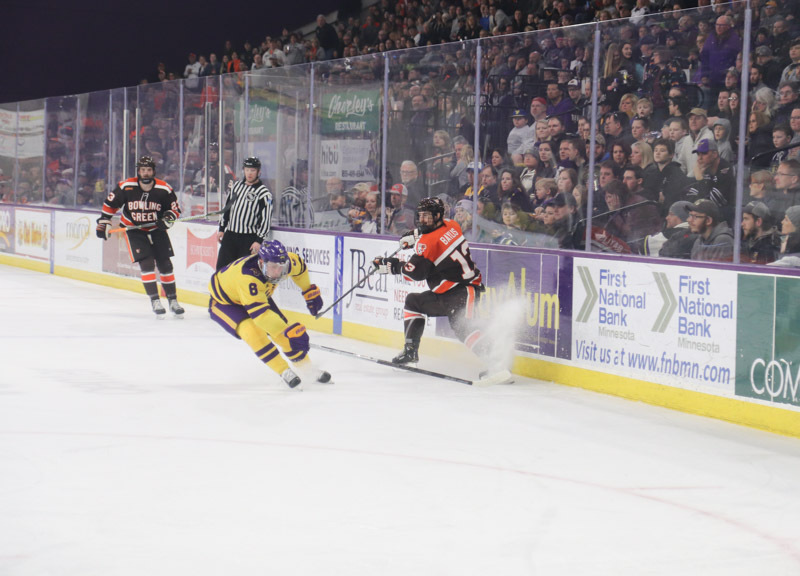 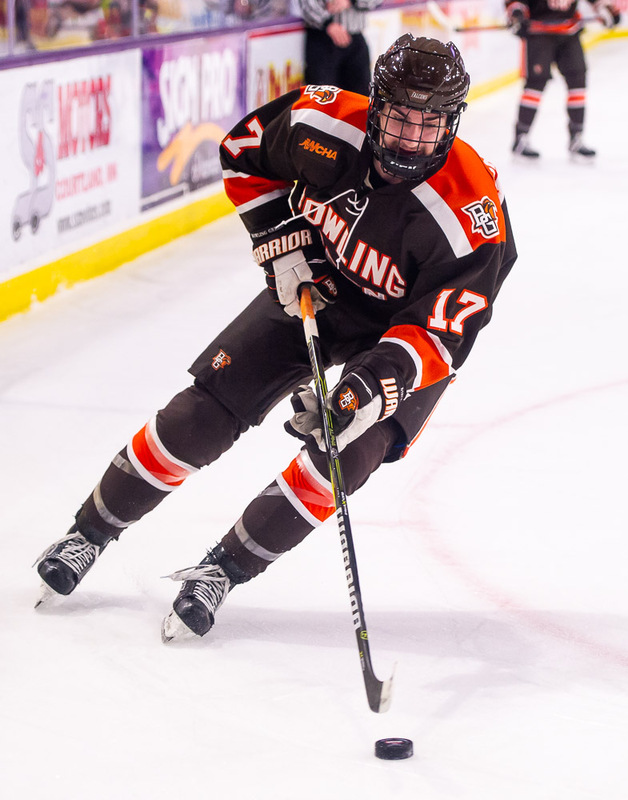 Alec Rauhauser’s wrist shot from the blue line crossed-up McKay to give the Falcons the important two-goal lead. Max Johnson and Connor Ford assisted on the play. 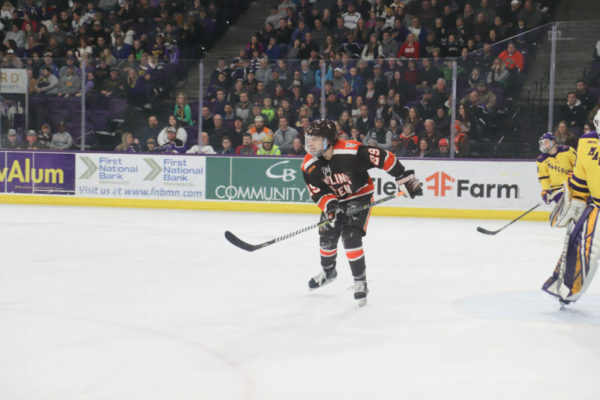 The Mavs started their comeback with an extra attacker goal at 18:16 of the third period. Jake Jaremko’s shot from the far faceoff circle beat Bednard who had to scramble to get to his skates. 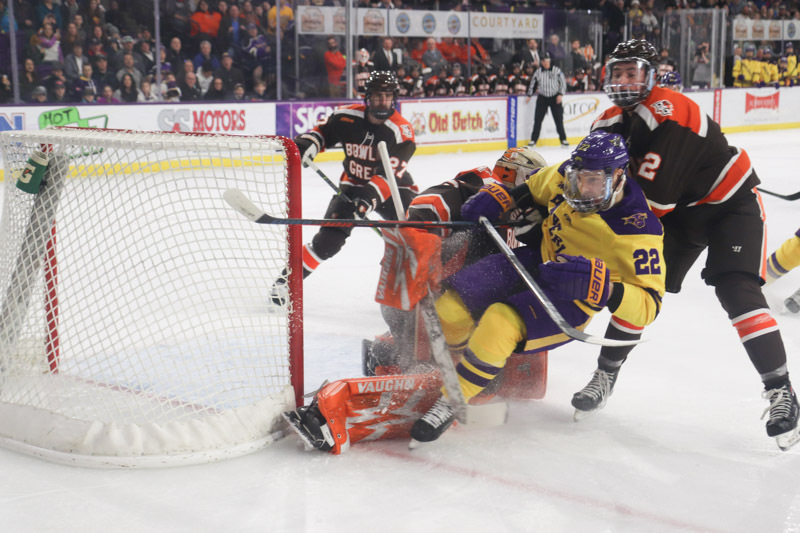 Minnesota State completed the comeback with a Connor Mackey goal from the blueline at 19:00 to tie the game at 2-2, sending the championship game to sudden-death overtime. Minnesota State pummeled Bednard with 15 shots in the final frame, while Bowling Green managed just a pair of shots on net. 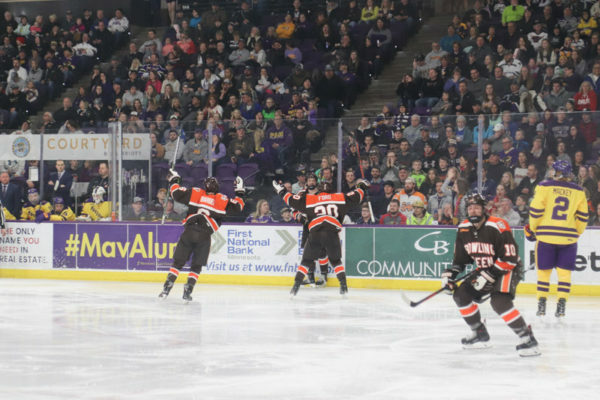 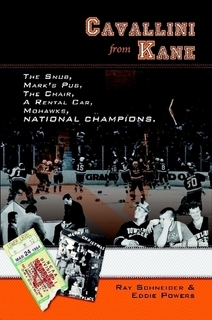 The Mavs scored the championship-winning goal at 1:37 of the overtime period. 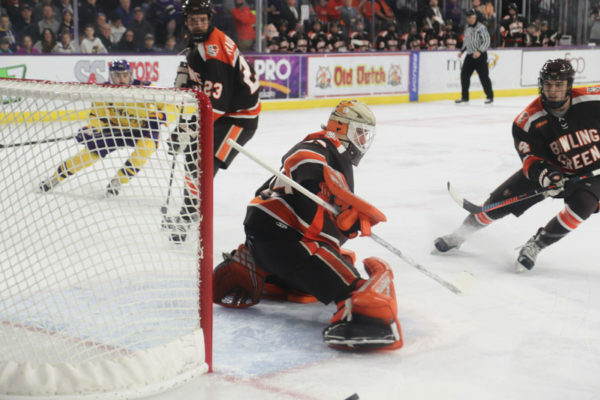 Nick Rivera netted a rebound goal to give the Mavs the 3-2 victory. 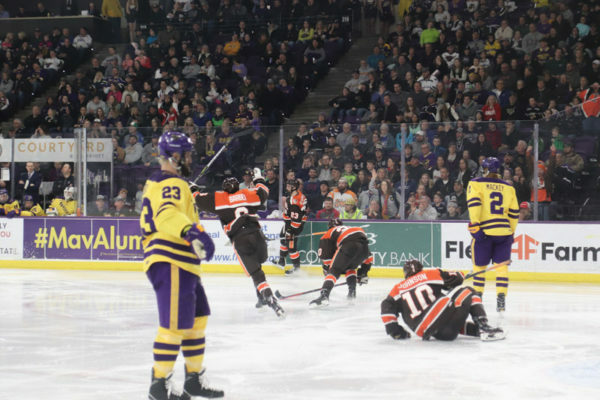 Both teams had a single shot in the overtime period. With the loss, the Falcons fall to 25-10-5, 16-8-4-3 on the season. 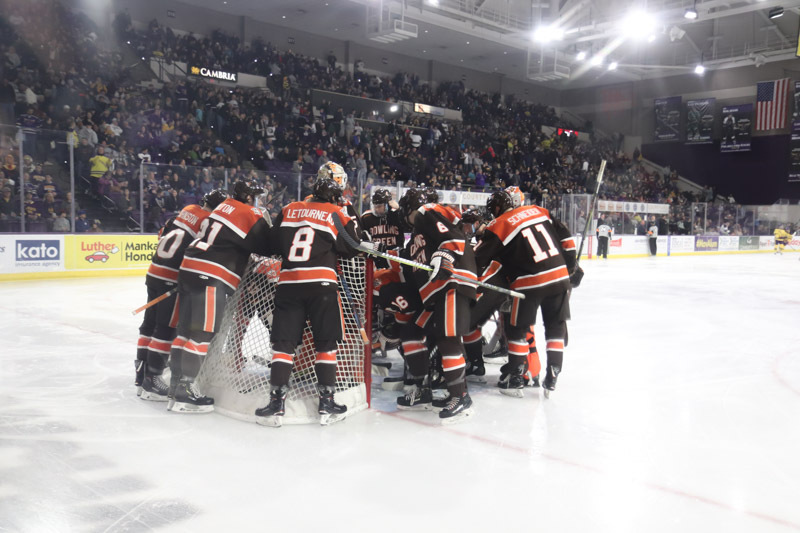 The Mavericks improve to 32-7-2, 22-5-1-1. 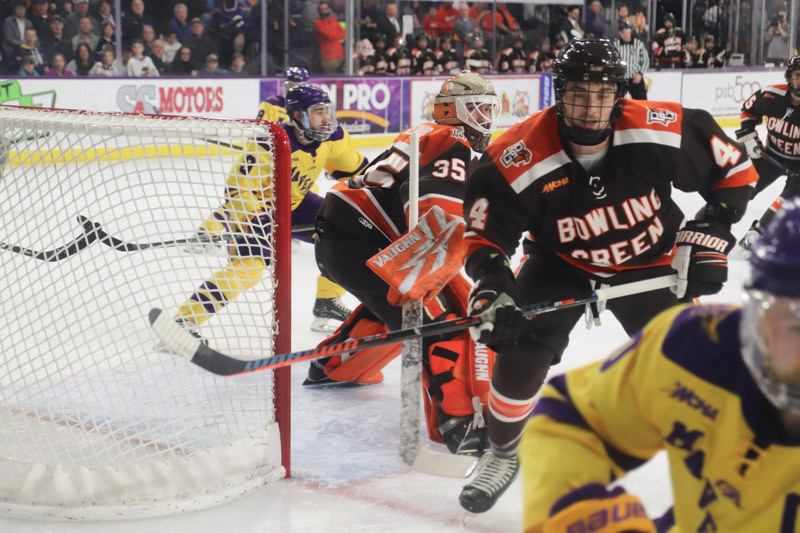 The Falcons’ season won’t end, however, as they earned the last at-large berth in the NCAA Tournament that will start next weekend. 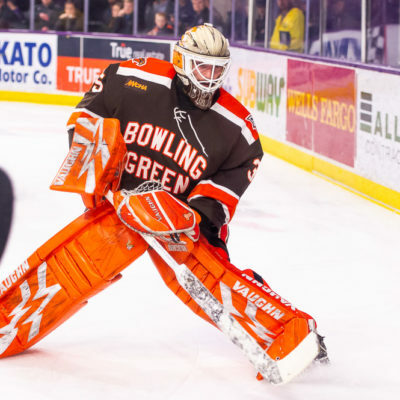 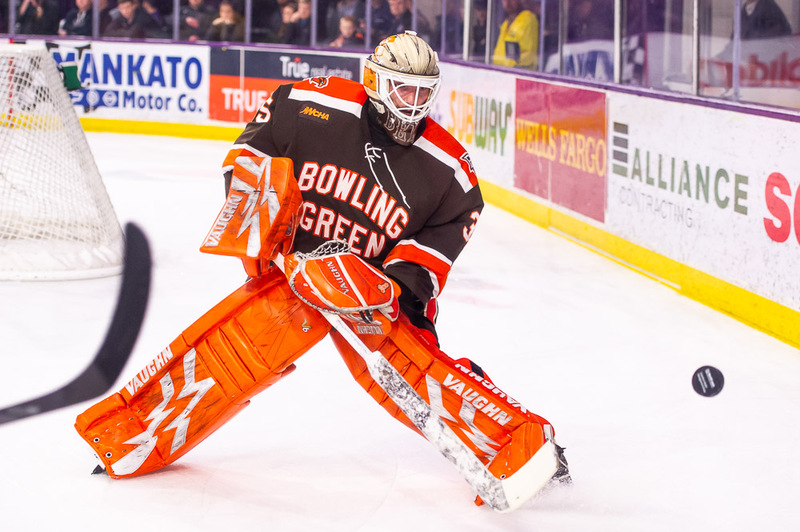 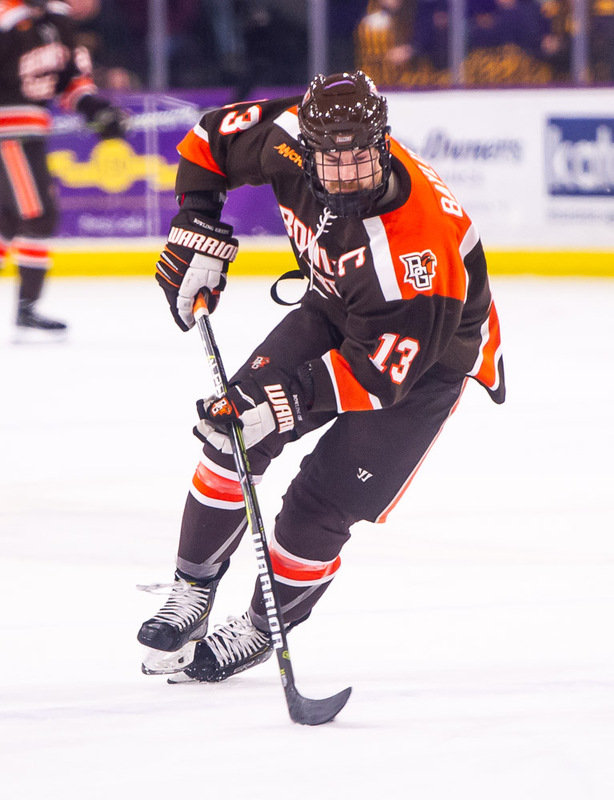 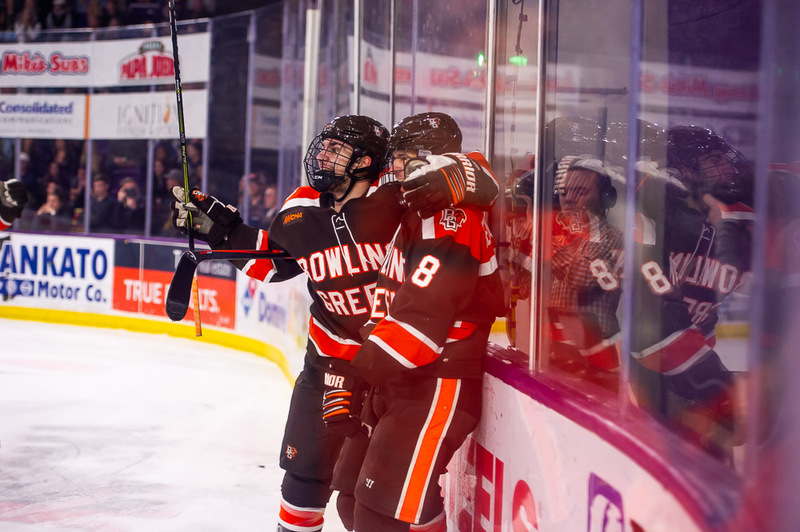 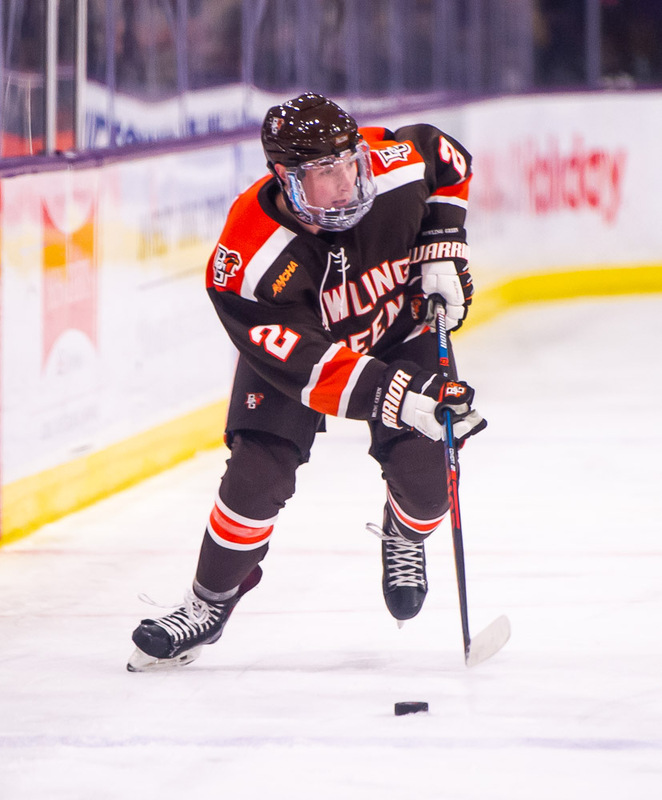 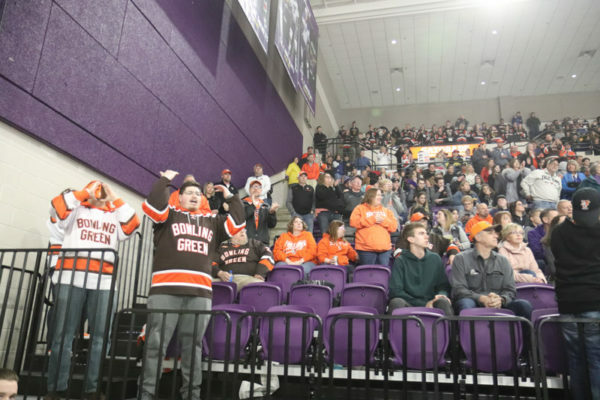 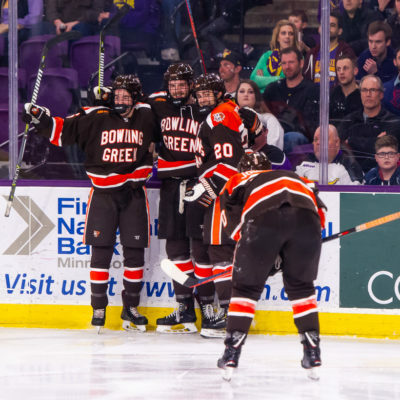 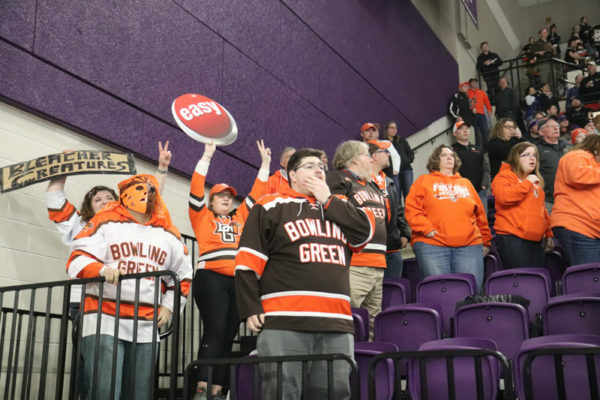 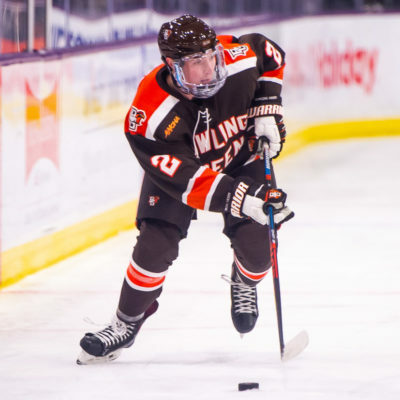 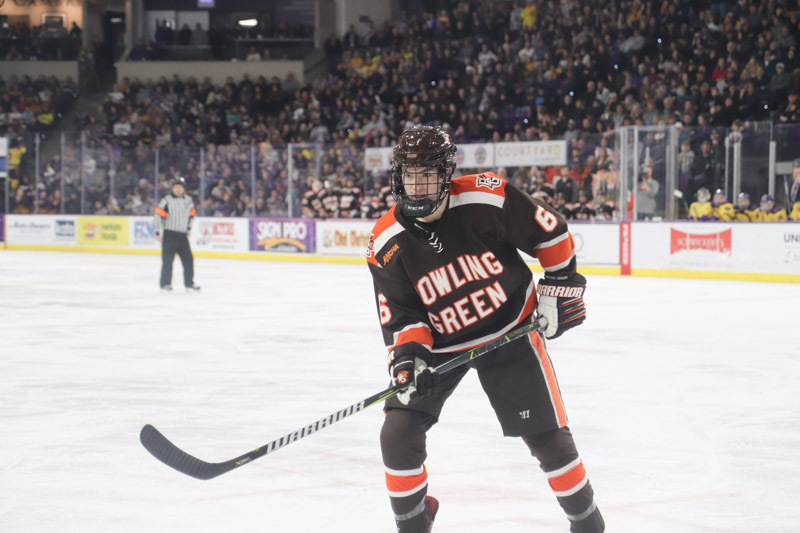 Bowling Green won’t learn their destination or opponent until Sunday night’s Selection Show.